Earlier in the week all the forecasts had been showing that today would be a good weather day but by Friday it had all changed and every forecast I checked was indicating a very cloudy day. 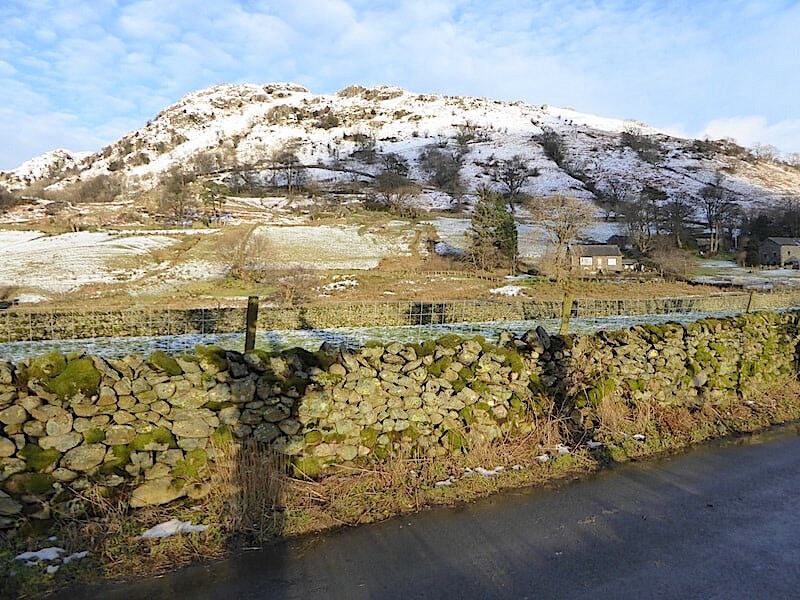 With that in mind we didn’t start out with a pre-determined walk plan today other than we would drive over to Hartsop and take a walk up Brock Crags. There are plenty of options for routes from Brock Crags so once we were on the top we’d decided we would see what the weather was offering and then plan on where we would go from there. 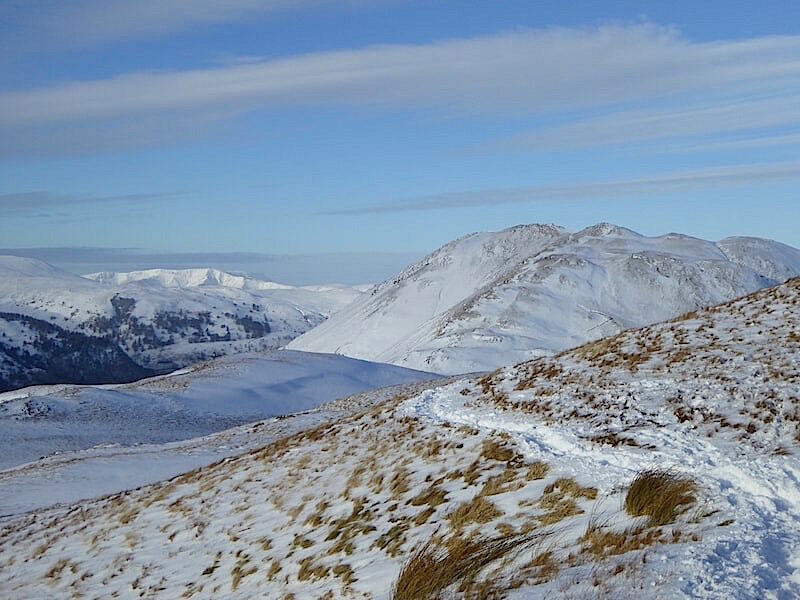 The morning was very grey and gloomy indeed but by late morning we could see patches of blue sky coming our way from the north west and from then on we enjoyed a fabulous walk in some superb conditions. 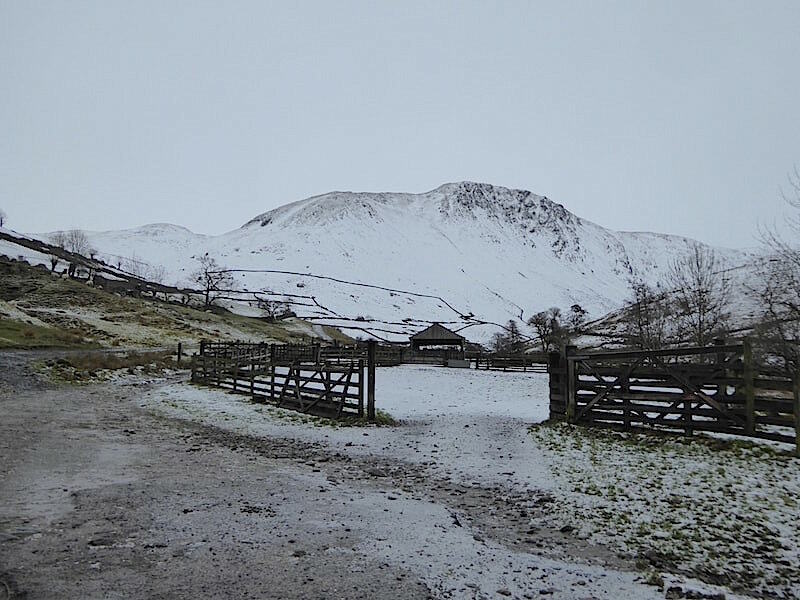 As we passed the almost empty car park at Cow Bridge we wondered if we should park there and walk up to Hartsop as the car park there can fill up quite quickly if you aren’t there early enough. We decided to risk it and found only three or four cars already parked up in the village car park when we arrived. Perhaps a quick glance from their bedroom windows at the morning’s gloomy outlook had deterred many people from setting out today. No-one was around so all their occupants had already kitted up and gone their various ways. Once we were ready we take the familiar path from the car park alongside the stock pens which are located just beyond it. 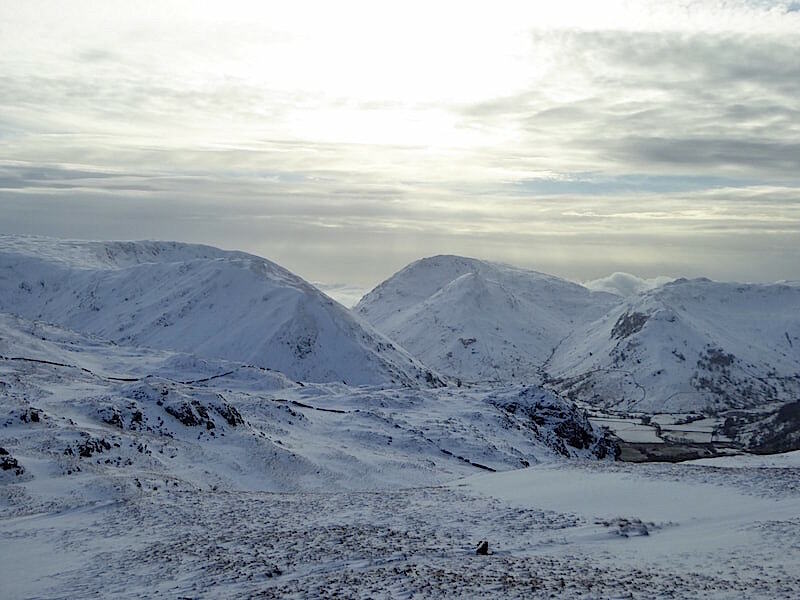 The temperature is hovering around zero and Gray Crag ahead of us looks very chilly indeed beneath a thick grey blanket of cloud. On the way up a look over to our right gives us a view along Pasture Bottom and the route up to Threshthwaite Mouth. 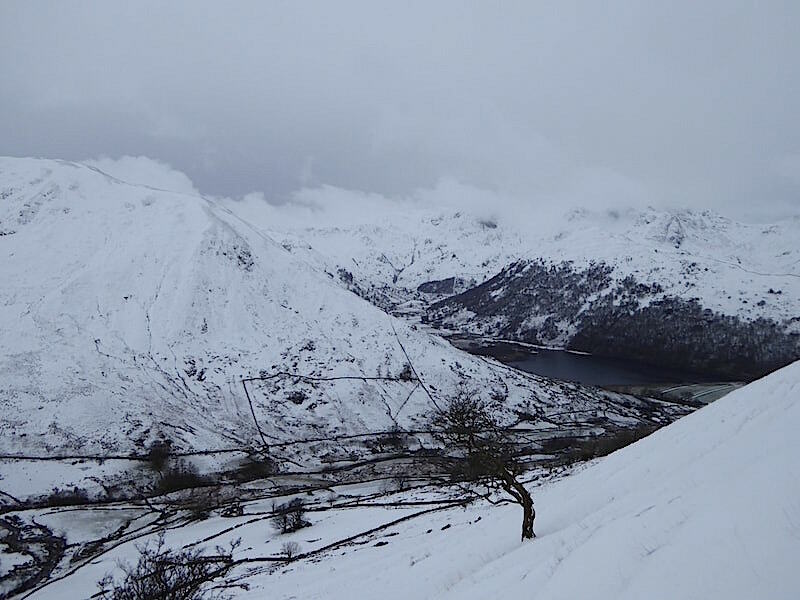 We walked up there in March 2015 and it was a very hard climb out of the valley in deep snow. 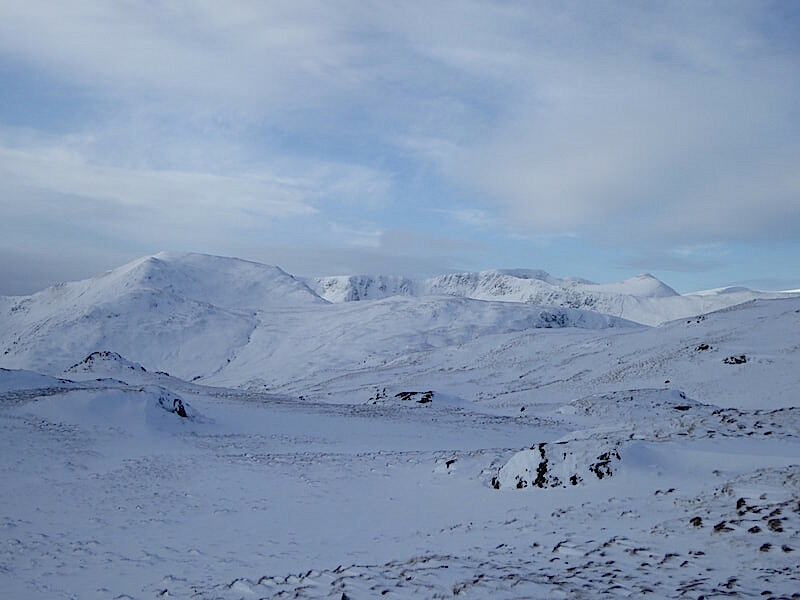 Having compared the view then with today’s there is much more snow now than on that day so the climb out would probably be even tougher today than it was then. 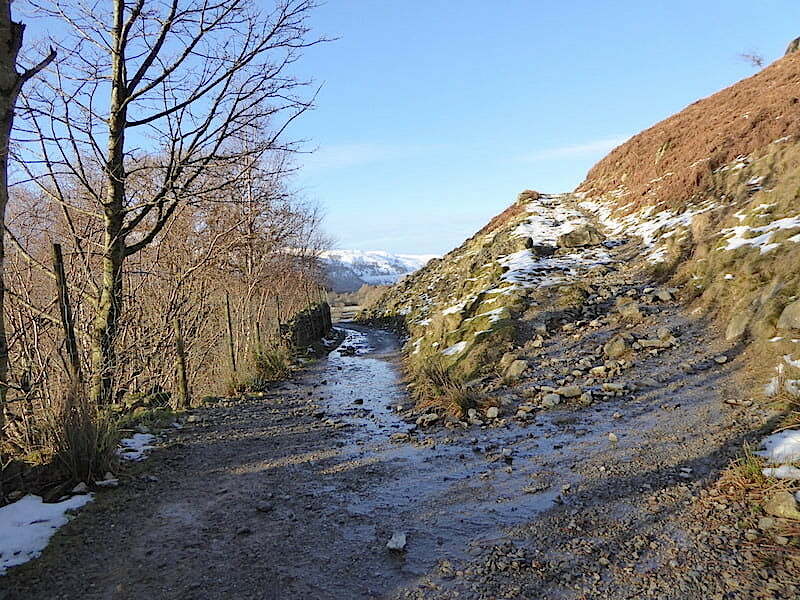 The path splits at this junction, on the right the path drops down to cross Hayeswater Gill and continues up to Hayeswater around the lower slopes of Gray Crag. 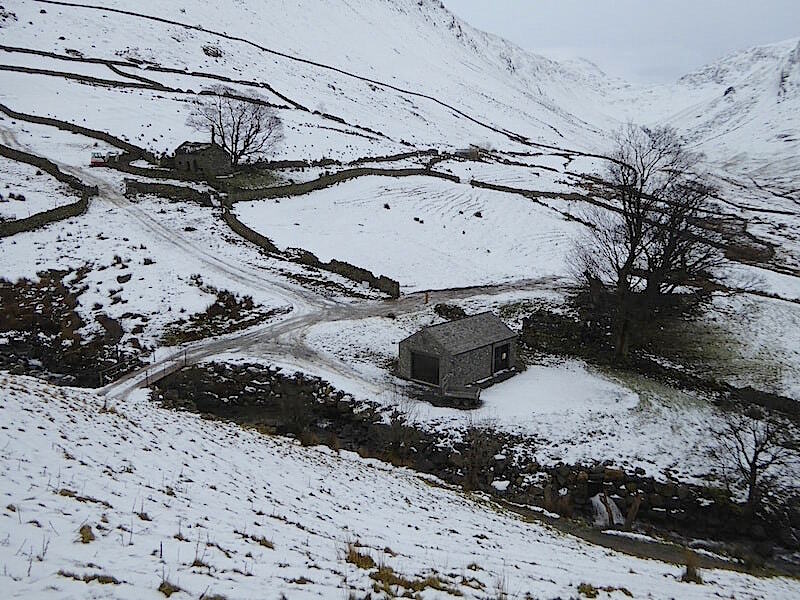 We’re not going that way today so we take the left hand path which leads up to the old filter house which used to filter water from Hayeswater when it served as a reservoir. 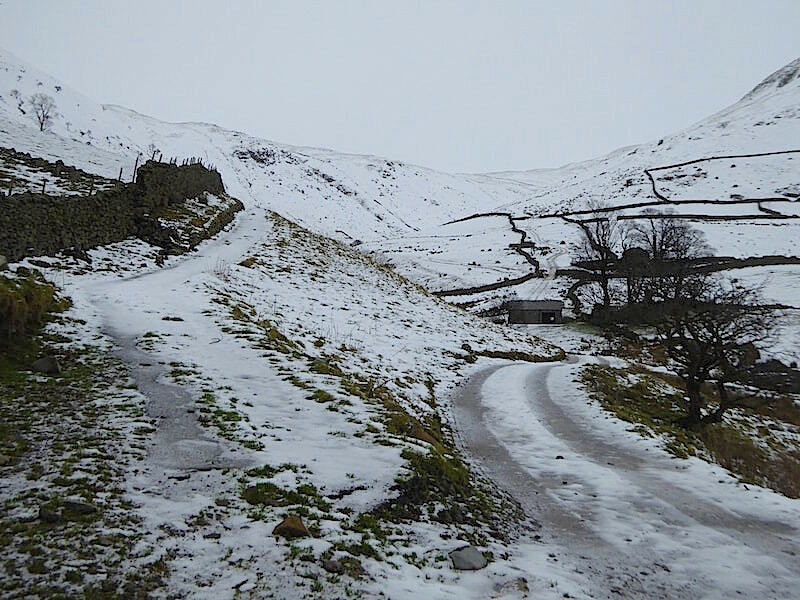 As we continue on up to the filter house the path we chose not to follow crosses Hayeswater Gill directly below us. 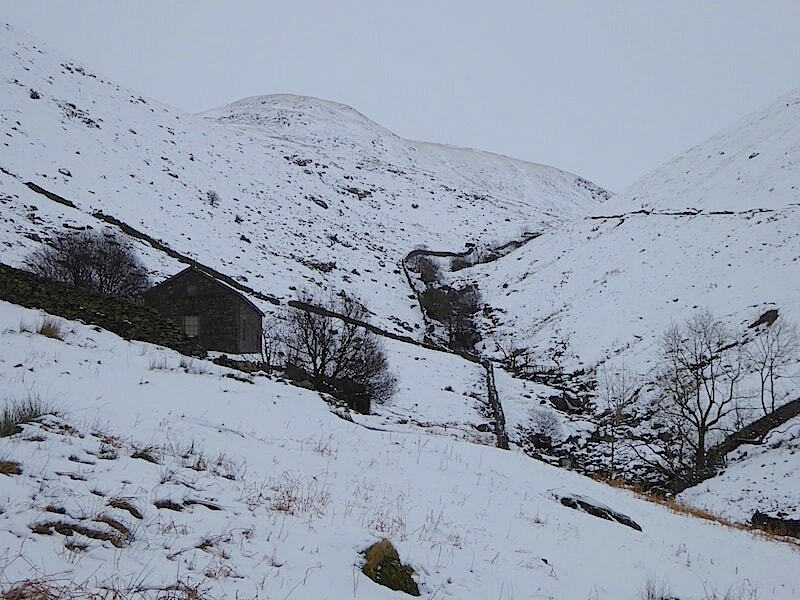 To the right of the path is the power house containing the generating equipment for the micro hydro-electric scheme which was completed in 2017. In the wall below, and to the right of, the building the outflow of water used by the generator is being returned to the gill. 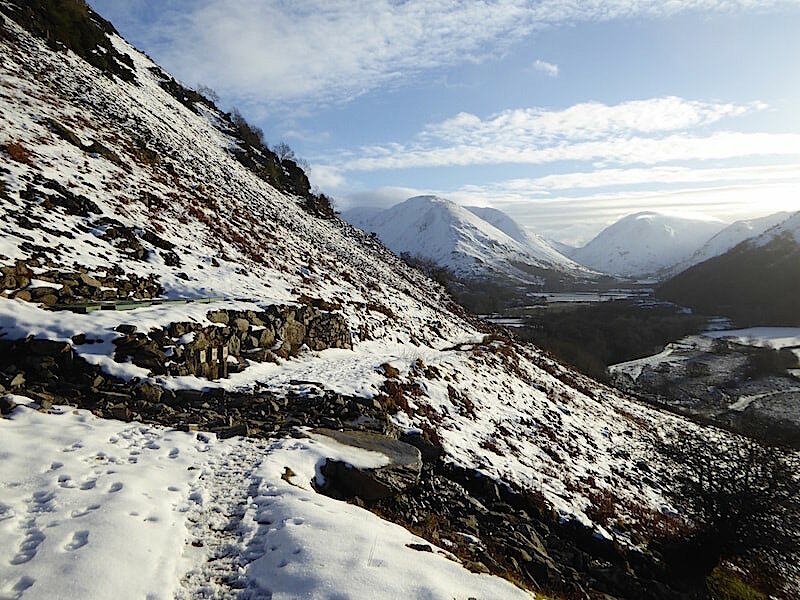 The path continues on up to the filter house and then turns back on itself across the southern slopes of Brock Crags. 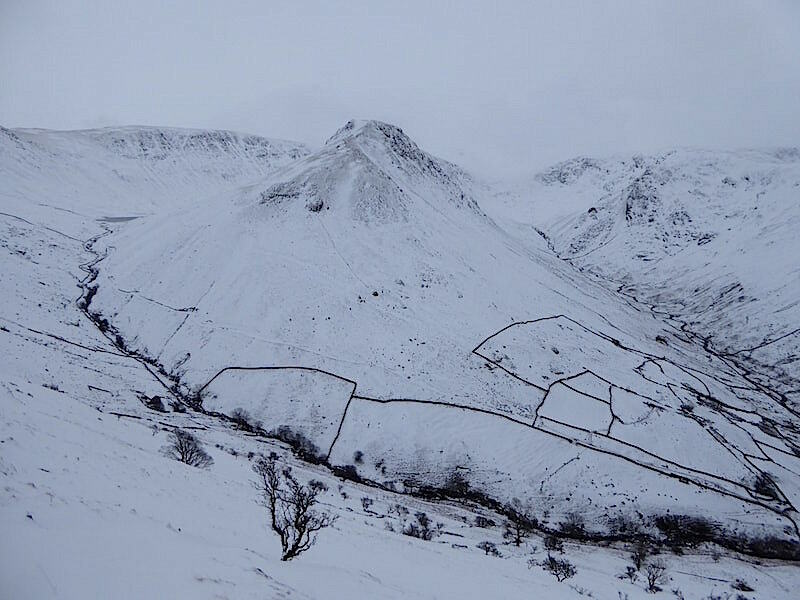 This ‘path’ is the course of the covered Hayeswater viaduct which crosses the fellside above the walled enclosures above Hartsop village. Further along we leave the viaduct path and double back once again and begin to climb more steeply towards this ruined wall. You could climb directly alongside this wall from the viaduct path directly to the summit although it would be a very steep ascent. For now we take the marginally easier option and follow what is normally a grassy terrace along the fellside. 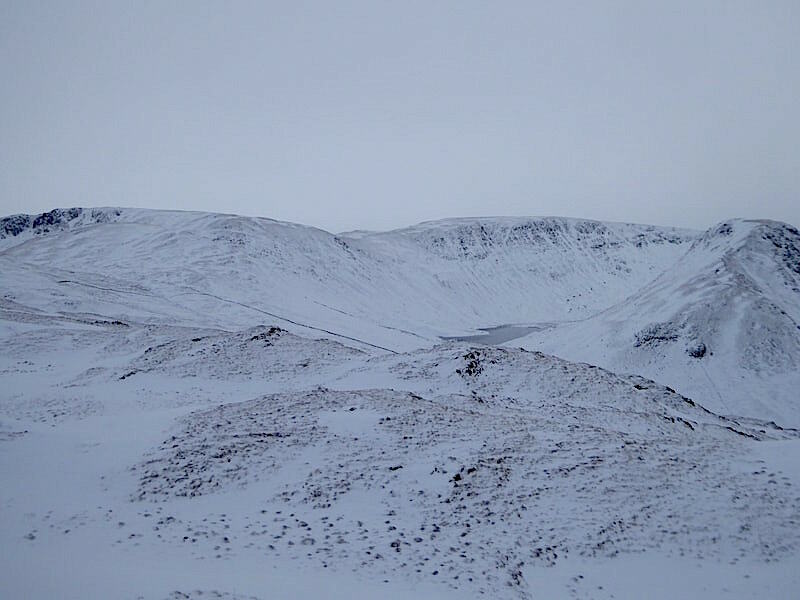 No grass to be seen today though as the whole route lies under several inches of snow and the going is tough. My jacket came off at this point, its hot, hard work walking through snow when you’re enveloped in a fluffy down blanket. Someone has already been on this path today though and although we can’t see anyone ahead of us we can see their footprints and make full use of them. Its a whole lot better than walking the path itself alongside which the snow has formed deepish drifts. 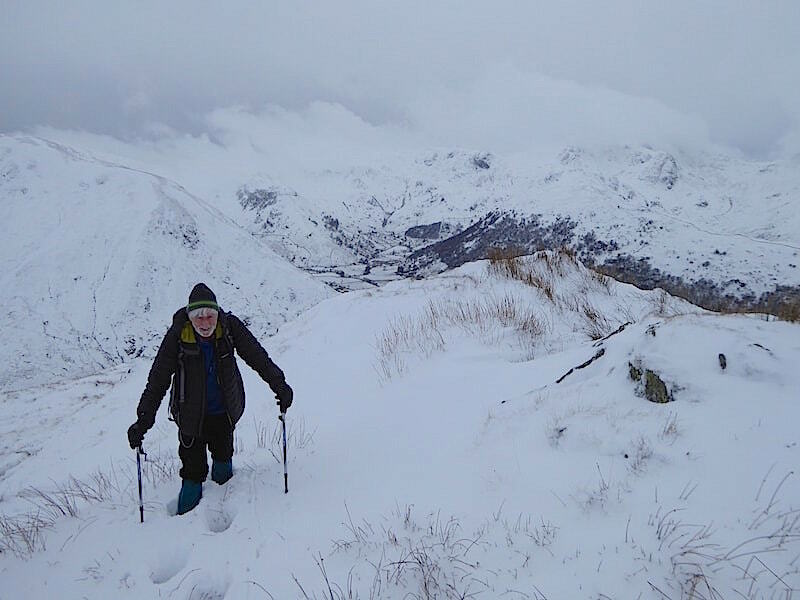 We continued on beyond the gap in the wall intending to follow it to Calfgate Gill …..
….. but we came to a point at which the footprints we had been using turned up off path to our left and continued on sharply up Brock Crag’s steep southern slopes. 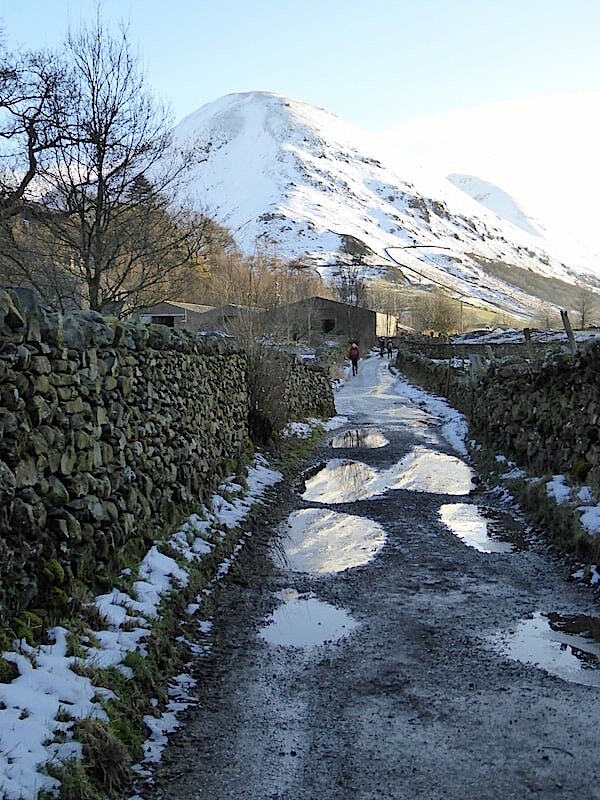 Should we follow and use these footprints or stick to our usual route towards Calfgate Gill. Looking straight ahead of us we could see no prints in the pristine and deeply drifted route so it was time for a decision. Straight ahead is not as steep but would be a hard slog through the untrodden drifts, following the footprints would make things a little easier but the climb would be very steep. After a bit of discussion (aka dithering) we opt for the steep footprint route up. 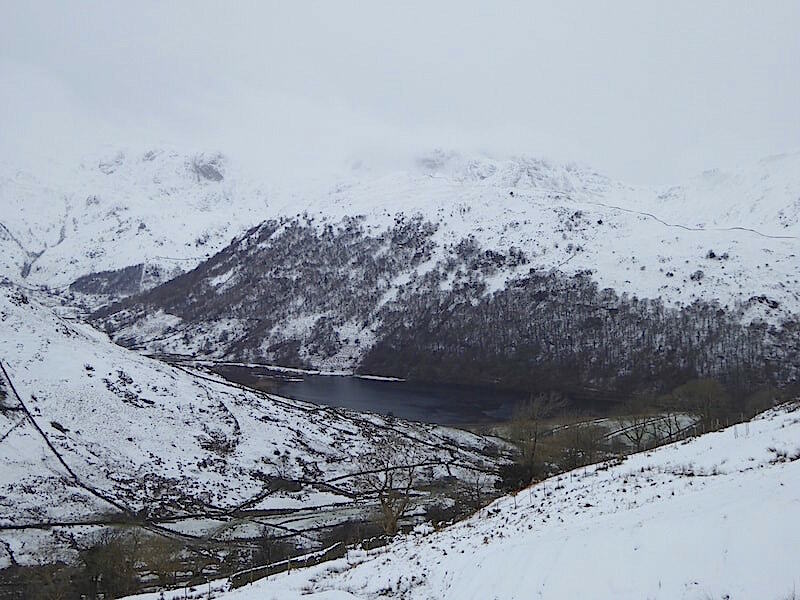 Before we begin the slog I took a look back towards Brothers Water with the tree lined slopes of Hartsop above How alongside it, above which thick white cloud is drifting and obliterating pretty much everything beyond. A pause for breath and another look over my shoulder with Hartsop Dodd over on the left of the shot and Brothers Water to its right. 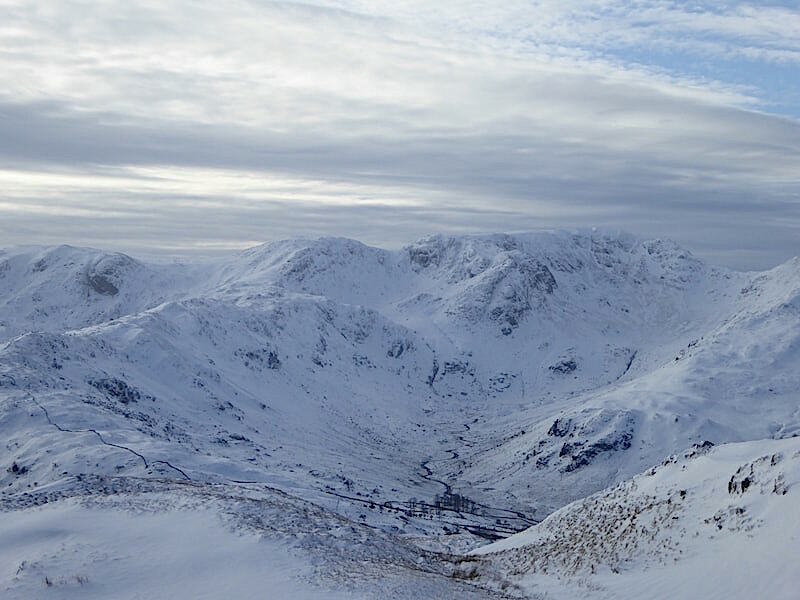 The route may be very steep but the view of Gray Crag, with High Street to the left of it, was well worth the effort. The footprints plus our spikes were doing a grand job of getting us up through the very deep snow without too many problems, but it was a demanding ascent nevertheless. Looking across to the Hayeswater Gill path along the lower slopes of Gray Crag we could make out two pairs of walkers and one lone walker below us, although it may be difficult to distinguish them in the shot. 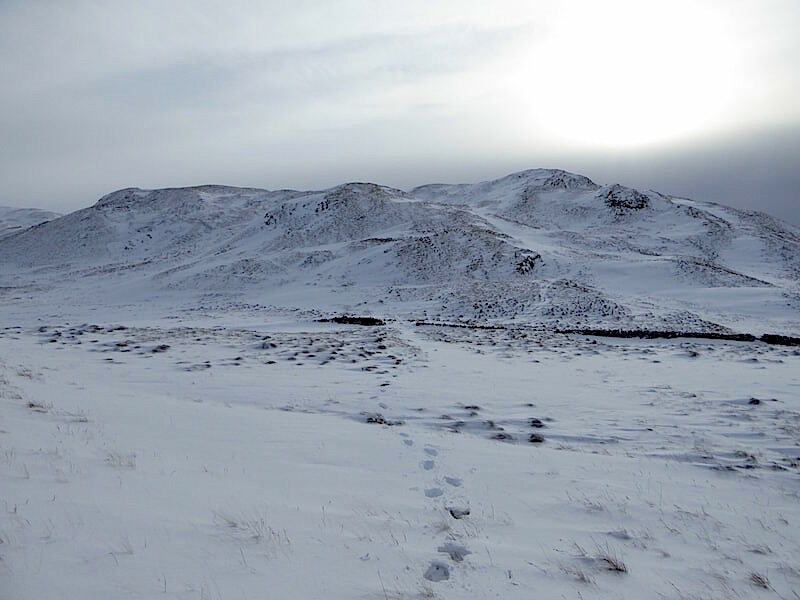 A couple of hundred yards above us we finally saw the owner of the footprints we had been following, a solo lady walker. She was taking her time and being just as careful as we were, a steep snowy slope with a rocky gill far below it is not a place to be taken lightly. 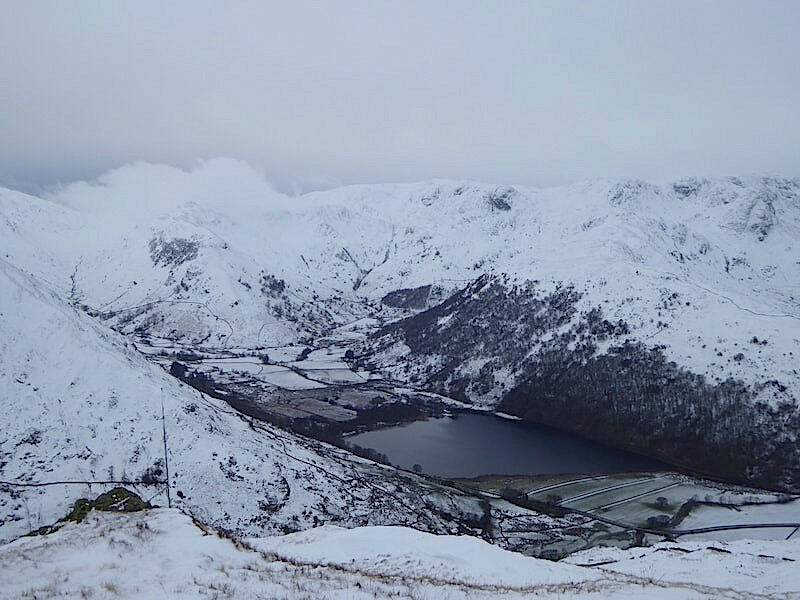 The view down to Brothers Water from just below the summit of Brock Crags. 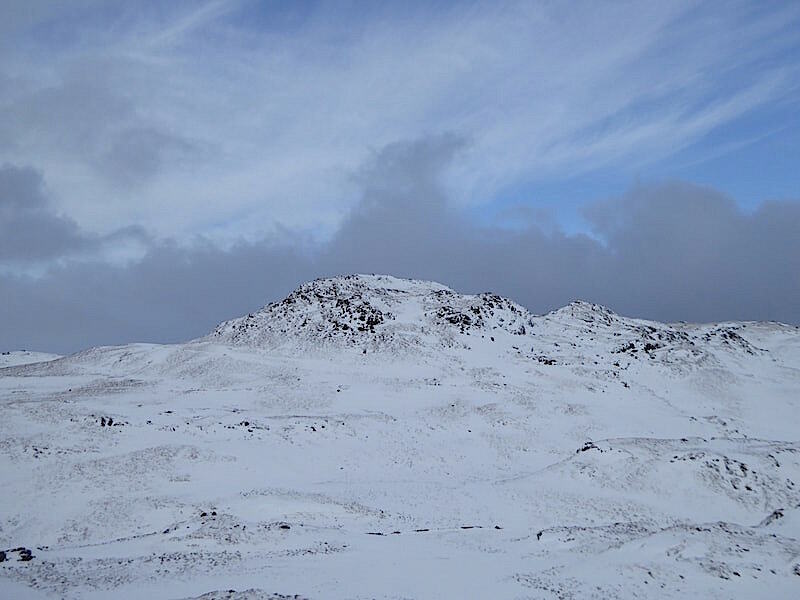 The thick white cloud still billowing around the higher fell tops above Deepdale. 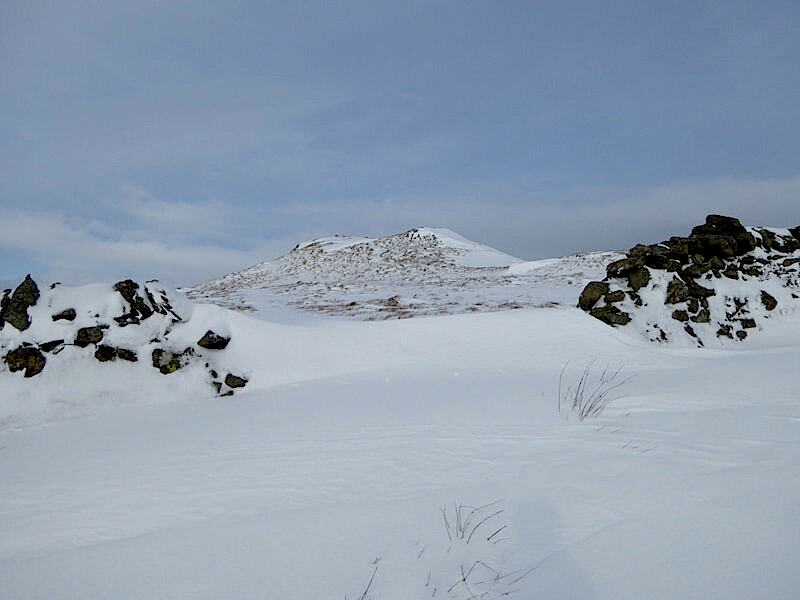 As we reached the slightly undulating area just below the summit cairn we could see the solo lady walker beside the cairn. We began the journey across to it as she began making her way back from it. Our respective routes were almost parallel so when I thought she was within earshot I shouted a “Thank you,” to her. “What for?” she replied. “For the footprints,” I replied. “No need,” she said, “I was only following the chap ahead of me!” We had a brief chat about this and that, as you do, and then she went on her way, there was no sign of the chap she’d been trailing though. 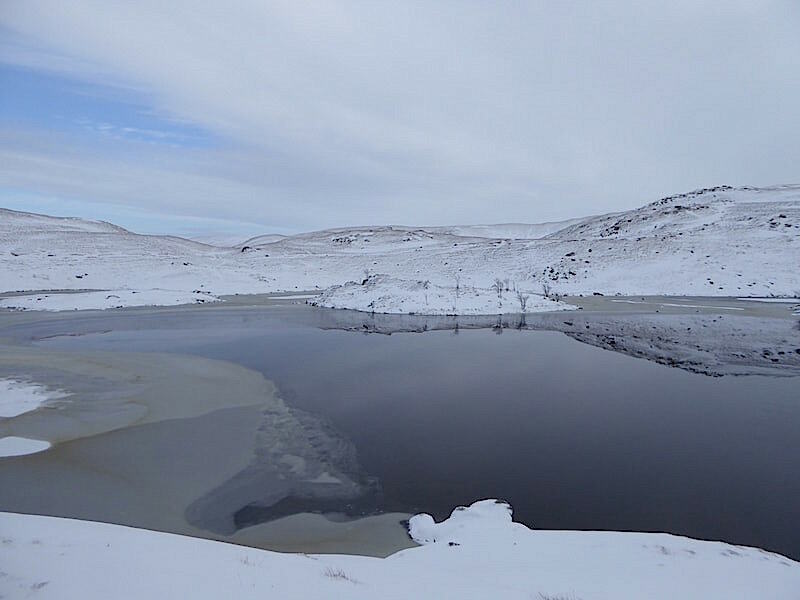 A look across to the right as we crossed over gave us a lovely view of a frozen Angle Tarn. 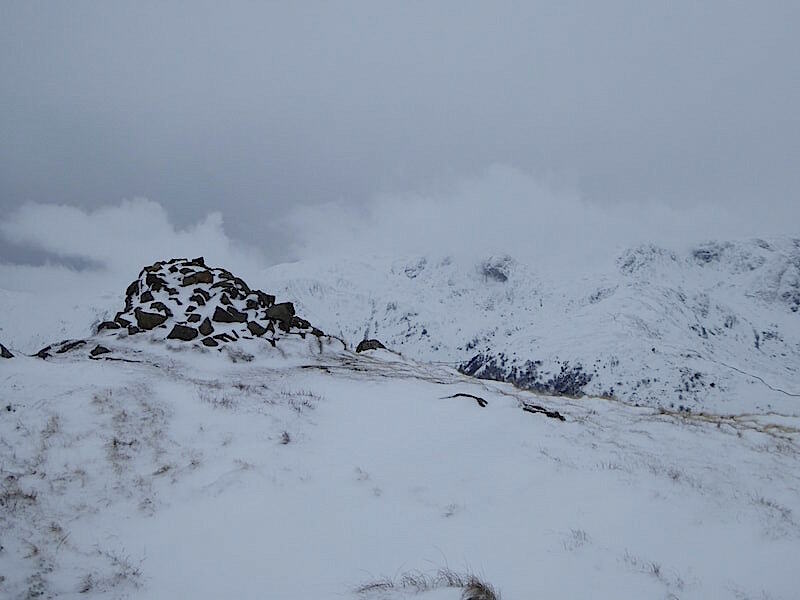 The summit cairn on Brock Crags and the white cloud still billowing around the fells to the west of us. 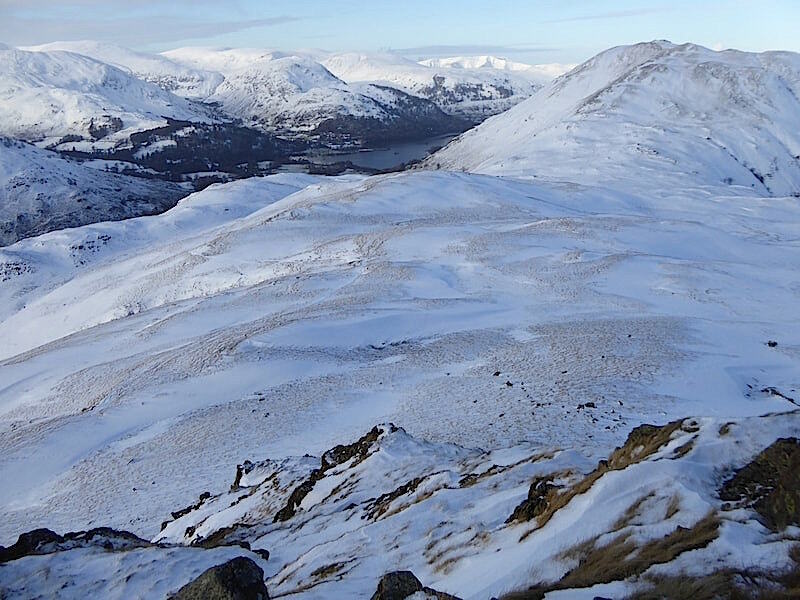 A grand view down to Brothers Water from Brock Crags summit. 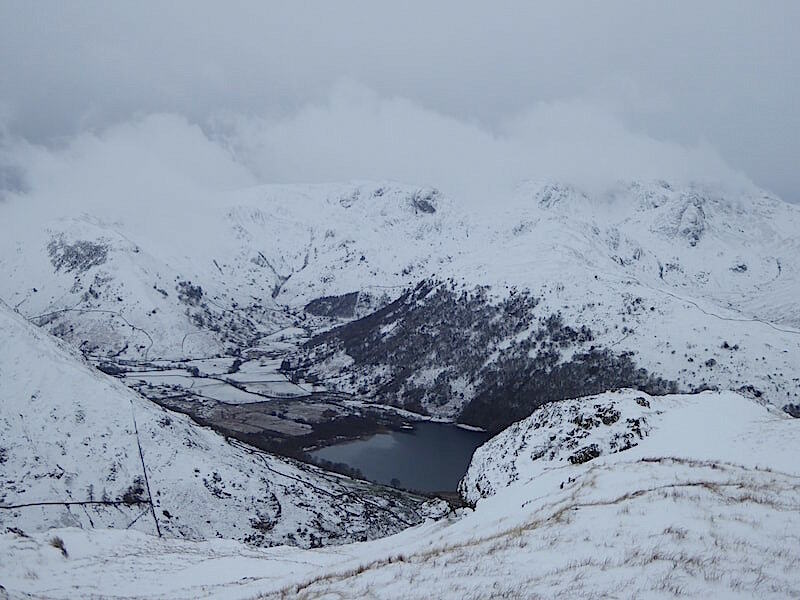 A little further to my right and above the wooded slopes of Hartsop above How the cloud has drifted away and on the right we can see Saint Sunday Crag quite clearly now. 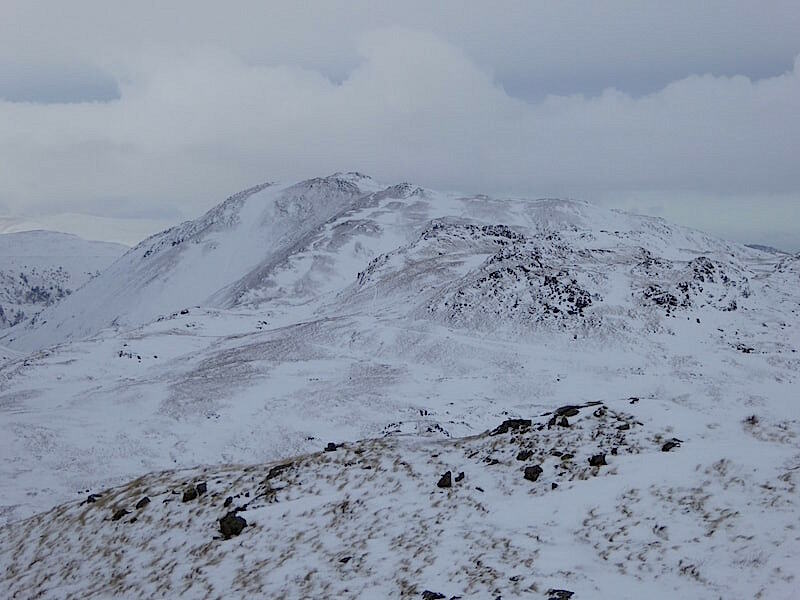 Its left hand slope dropping down to Deepdale Hause to the left of which is Cofa Pike and Fairfield. 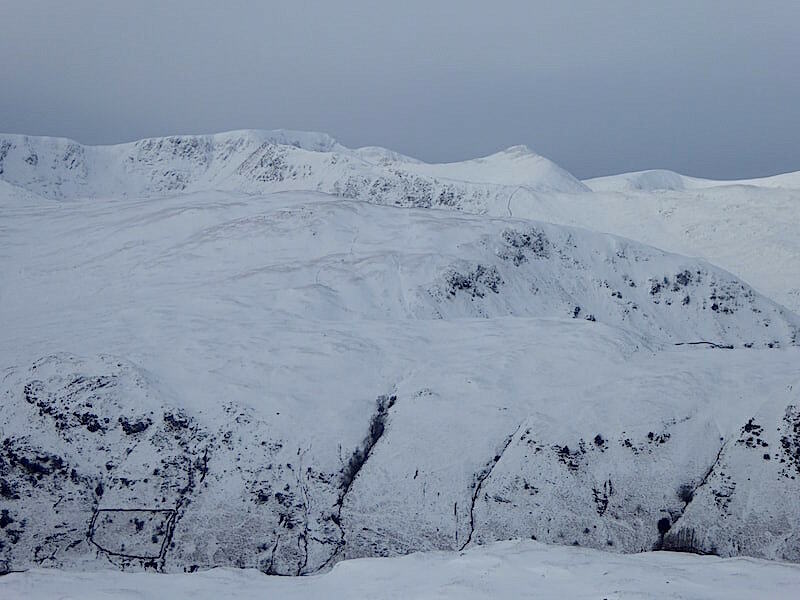 A little further to the right and now Saint Sunday Crag is over on the left with the Helvellyn range to its right. 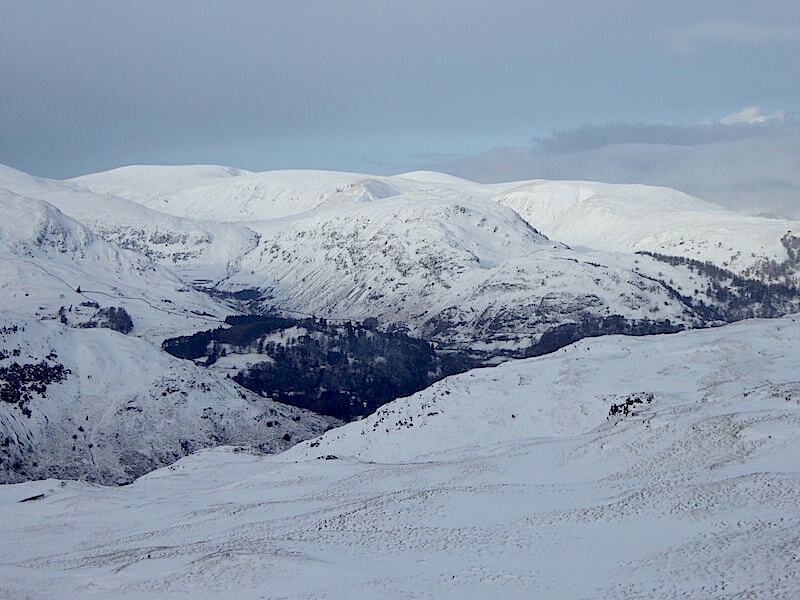 The skies to the south and west are still very grey and overcast …..
….. but as I look even further to the right I notice the merest hint of brighter skies beyond Hart Side and Great Dodd. 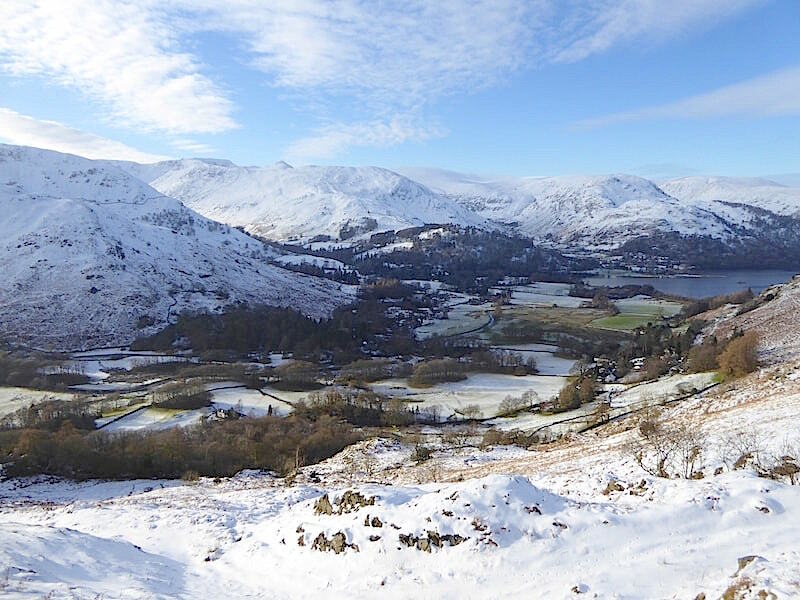 Glenridding is tucked in behind the trees at the head of Ullswater. 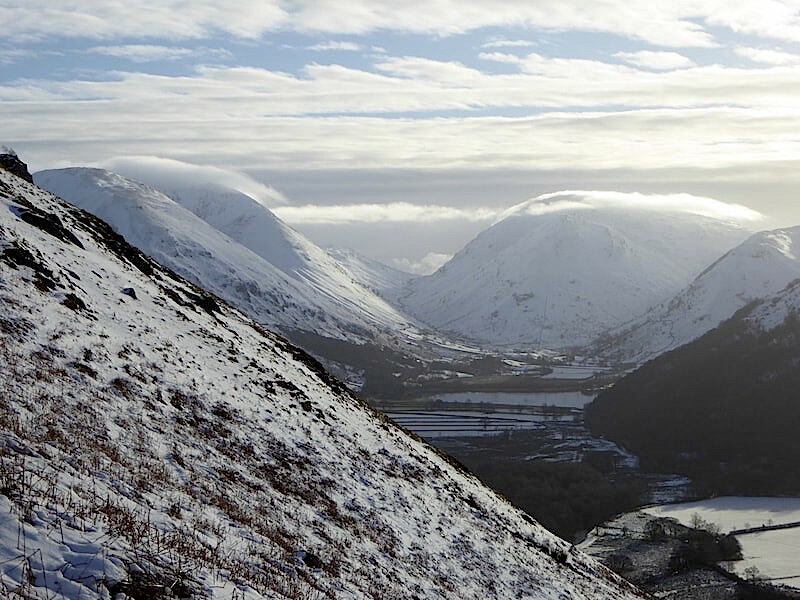 To the north of us on the centre skyline is Place Fell, below that and to its right are the craggy tops of Angletarn Pikes. There is still plenty of billowing cloud above them but there is definitely a lighter, and bluer, patch of sky beyond it. Looking south from the summit cairn where a faint sun is doing its best to break through the grey blanket, and where there is absolutely no sign of any break in the cloud cover. I’m back in my jacket now that the heavy lifting is done and where a very slight breeze is undoing all the good work that my hair brush did this morning. 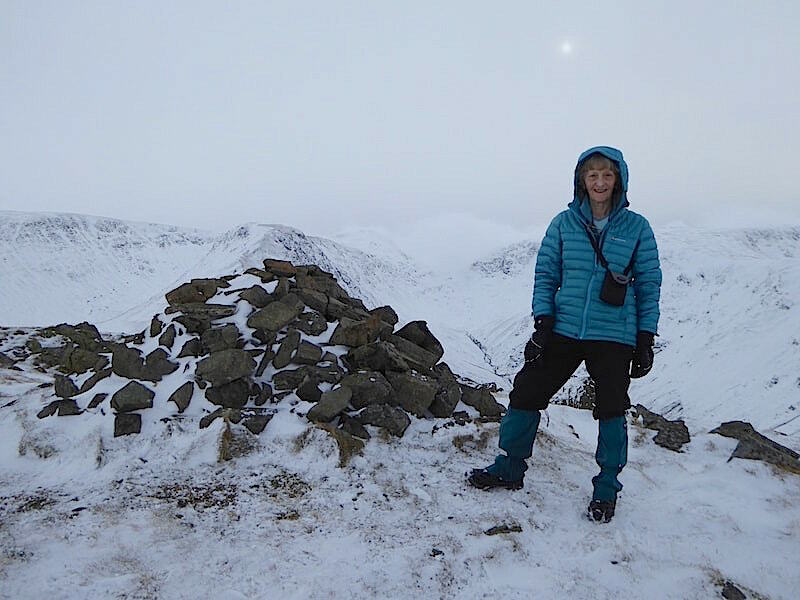 The solo lady is well on her way heading for Satura Crag by the looks of it, there’s no-one else in sight so we take advantage of the dry cairn stones, have a ten minute coffee break and keep an eye on the lighter patch of weather coming in towards us. Coffee break over so I take a few shots of the views around us. 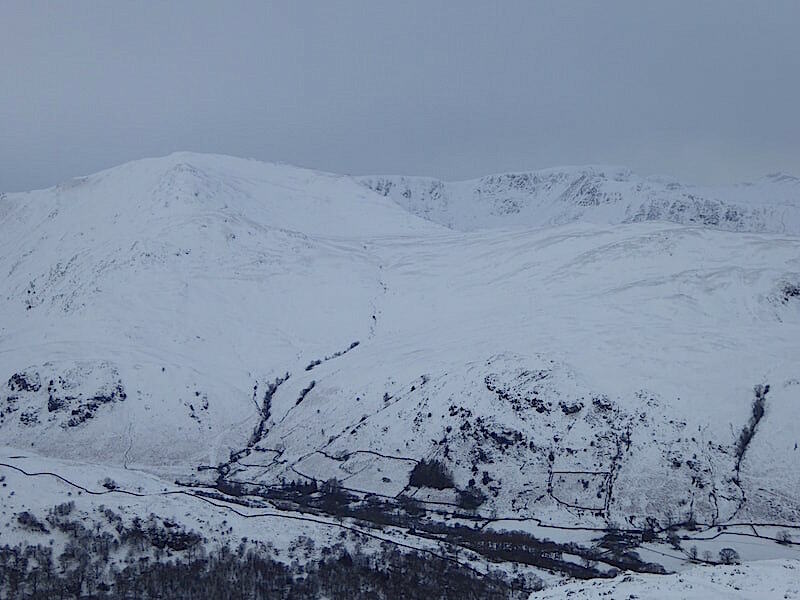 Over on the left is High Street, then Gray Crag, with the merest hint of Thornthwaite Crag to the right of it, while rising up from Threshthwaite Mouth is Stony Cove Pike. There’s quite a bit of white cloud behind Threshthwaite Mouth, the U shaped dip in the centre skyline, and it looks to be quite low lying so there may be an inversion going on around the Windermere area. Moving to the left we have a view of Rampsgill Head on the extreme left, then comes The Knott, followed by High Street with Gray Crag on the extreme right, with nothing but dull, flat grey skies beyond them …..
….. to the north of us however there is definitely more than a hint of brighter weather approaching which more or less determined where we would be heading for next. 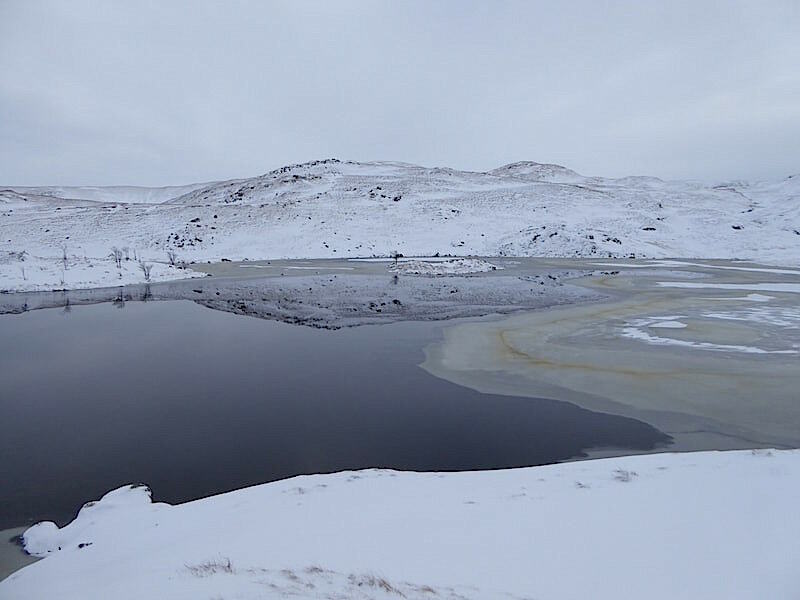 We had decided during our coffee break that, having had our fair share of overcast skies, it would be a bit daft to turn our backs on the approaching brightness so we hoist packs and head over to Angle Tarn. That’s no hardship at all for me since its a favourite place of mine, come rain or come shine. Mind you, actually getting across to it, although it didn’t exactly fall into the hardship category, was an entertaining little jaunt. 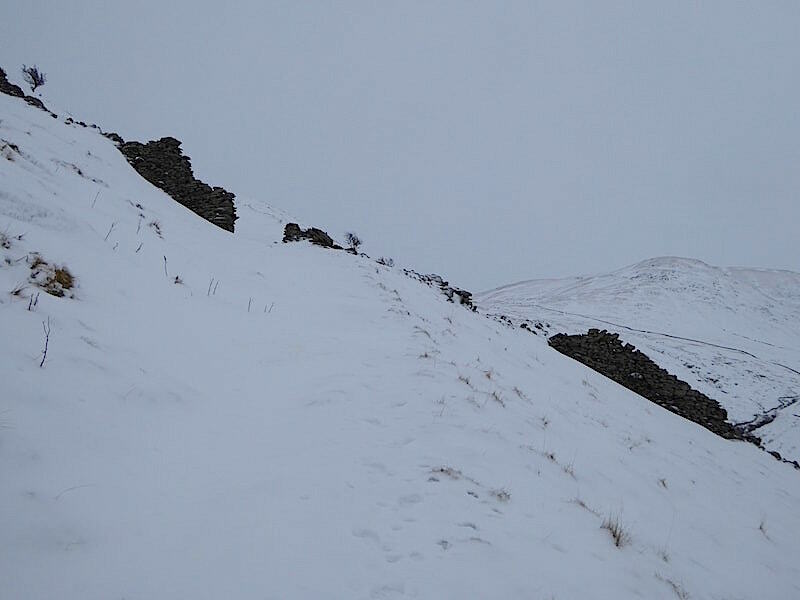 Deep snow everywhere, even deeper drifts across the paths and in the hollows of the undulating fellside. 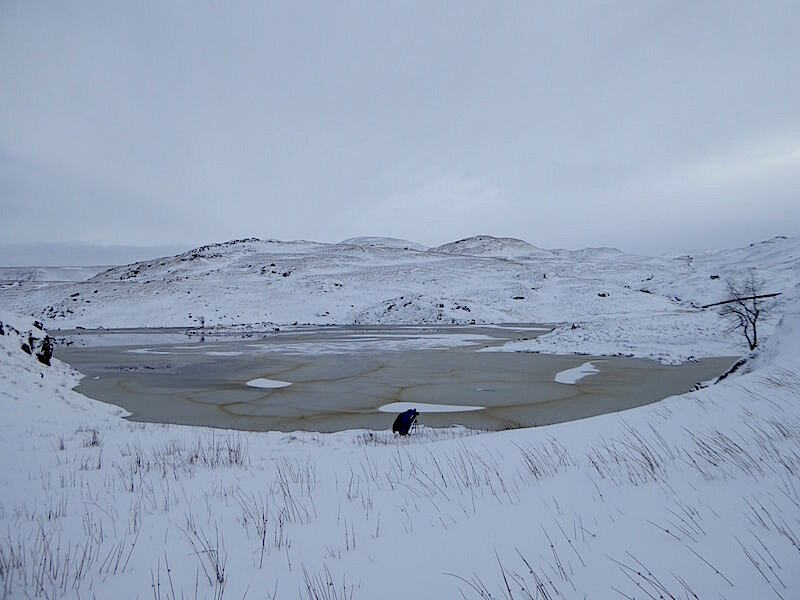 We tried to keep to the tops of the little knolls as much as possible but, inevitably, there comes a point where you have to cross from one knoll to the next and you know that a knee deep, or even deeper, plunge into the unknown will be coming shortly. We had plenty of falling over practice all the way across which gave rise to much hilarity because its not the falling over that matters, its more the getting upright afterwards. Quite apart from all that, why does my hair look as though its turned into a WW2 German army helmet? Let’s have a look at some of the surrounding scenery as we make our wobbly way across. 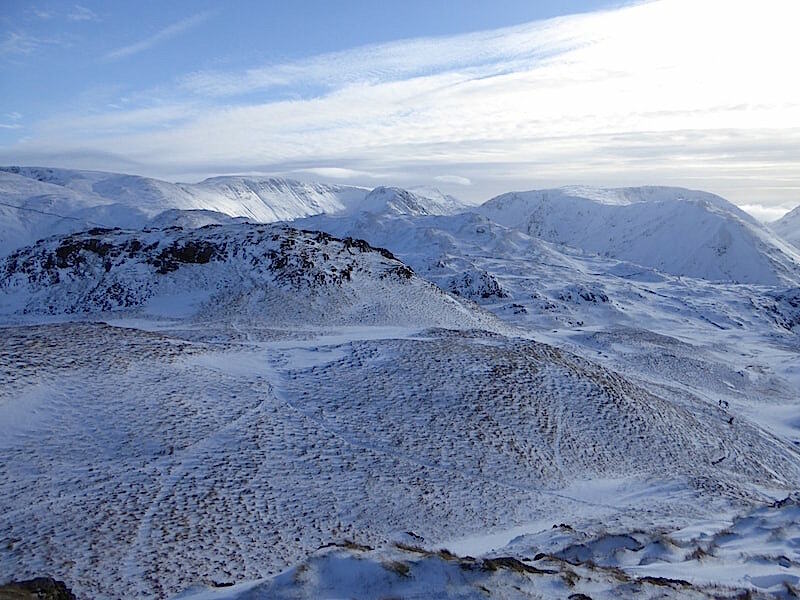 Here to the west of us is a view, across Birks in the middle foreground, of Helvellyn to the left of centre, with Catstycam to the right of it. 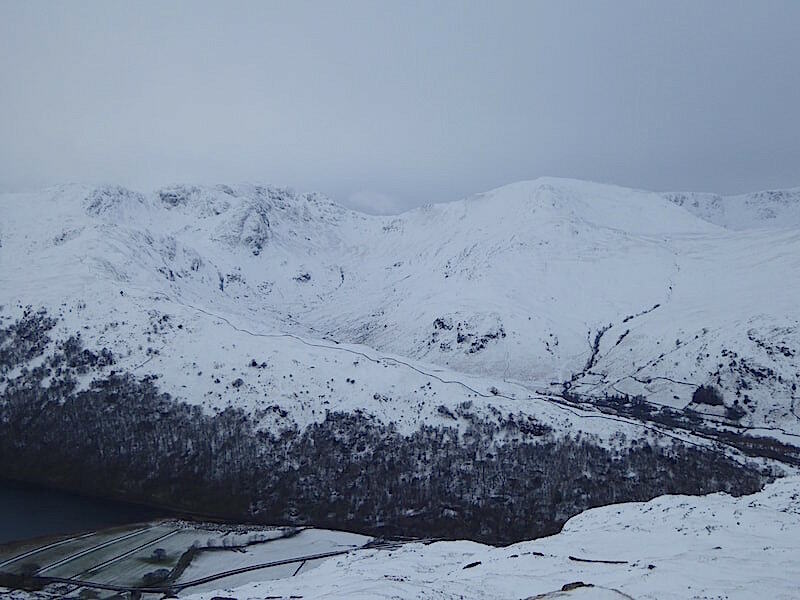 Too far away to see for sure but I’d put money on Striding Edge being very, very busy today. 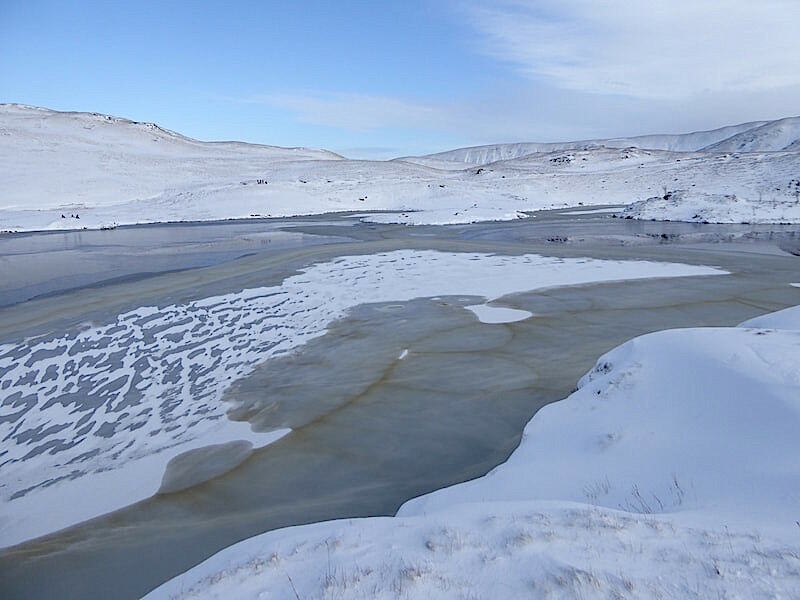 Hope they’ve all got crampons and ice axes at the ready. 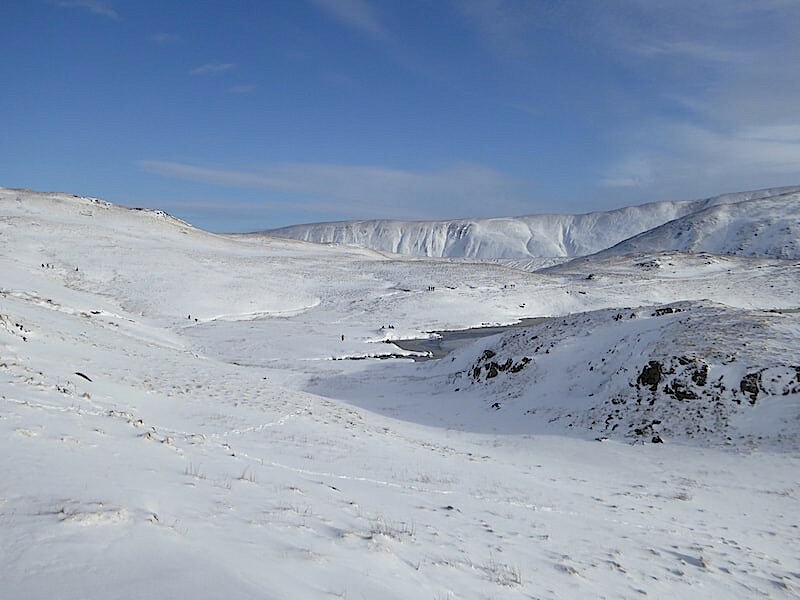 Plenty of snow cover on Sheffield Pike, Green Side and The Dodds over on our left. Behind us the cloud has thinned enough to allow some sunlight through, and its enough to cast this view of Brock Crags, behind us to the left, into deep shade. 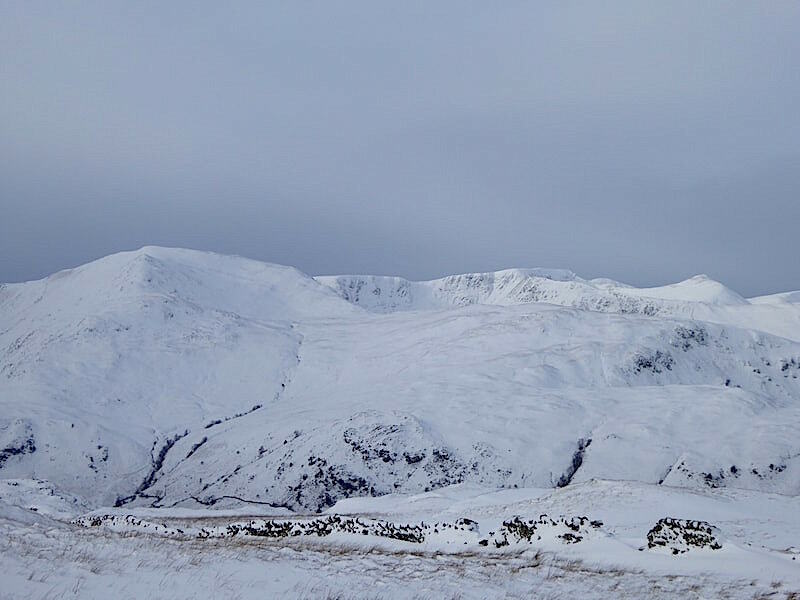 The cloud thinned a little more so another shot of the Helvellyn range together with Saint Sunday Crag over on the left. 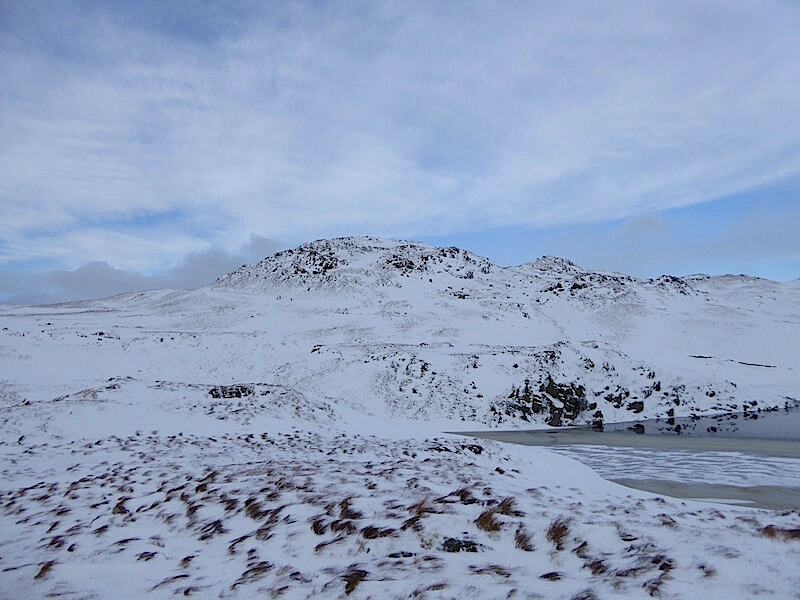 Immediately ahead a largish patch of very welcome blue sky as we head over to Angle Tarn. The path goes through the gap in the wall and can be seen continuing on beyond it so a straightforward crossing from one side to the other you might think. Not so, we are now mid-thigh deep and the drift only gets deeper. Seeing as nobody has been through here yet, and being a well brought up sort of chap J offered to go first and blaze a trail. He’s an inch shy of 6′ tall so a piece of cake for him then. Nope, he sank down up to his gluteous maximus, hand scrabbled a way through up to the wall and then had to climb out on hands and knees. 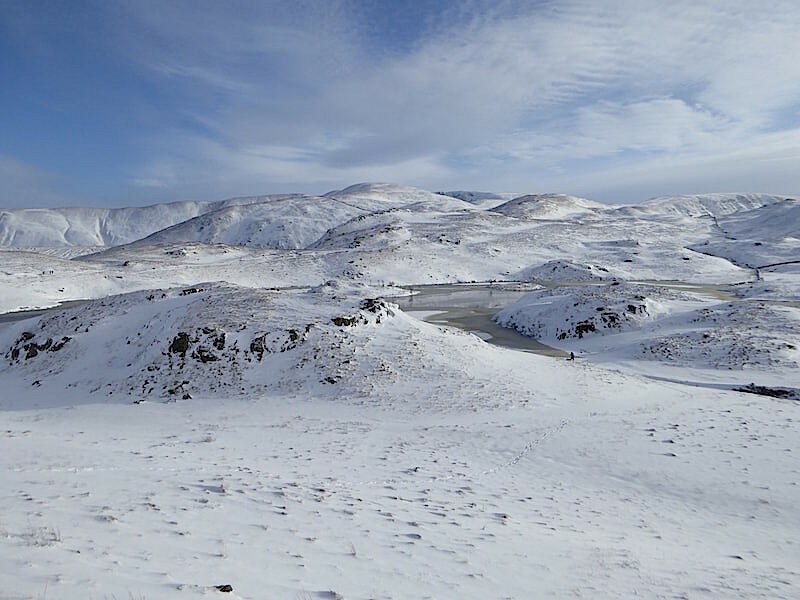 Despite the trail blazing it was no easier for me, being only 5’3″ tall my rear end sinks below the snow line and I make a similarly ungainly crossing and exit. 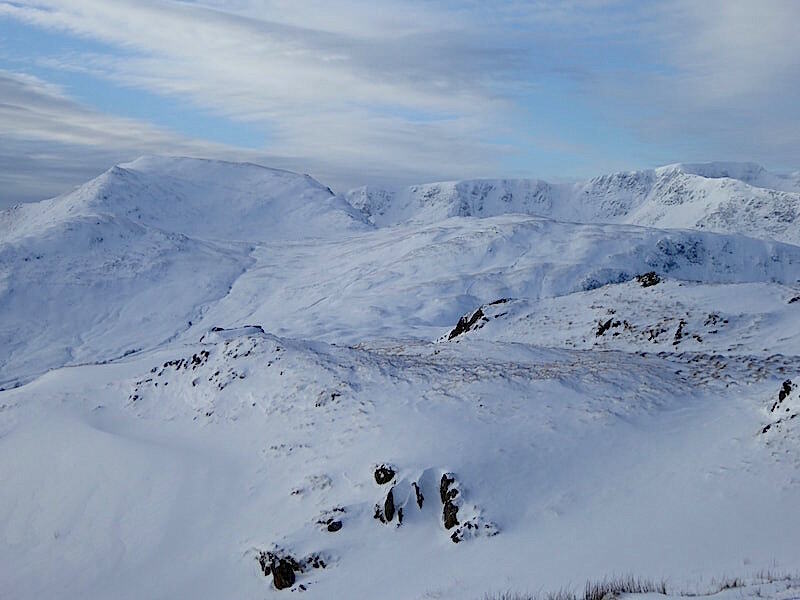 A look back to the wall crossing and Brock Crags as we plough across keeping out of as many hollows as possible. 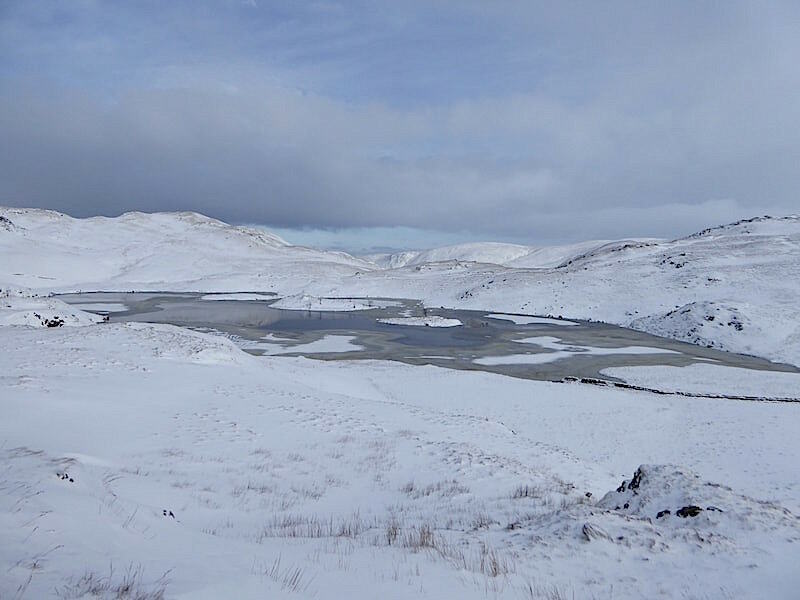 Angle Tarn gets closer as does the patch of blue sky with more following on behind. 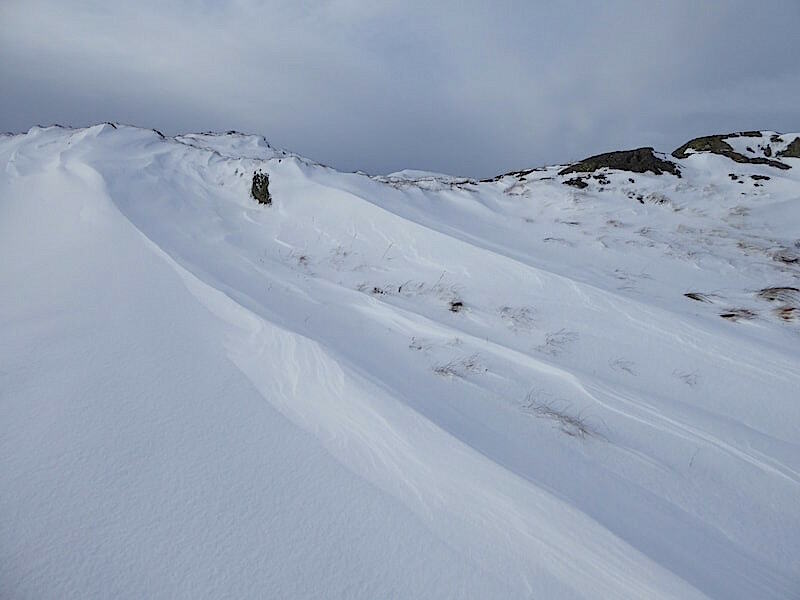 More deep snow drifts, with more sinking in and falling in as we cross over to Cat Crag. At one point J tried to haul me up by my pack’s shoulder straps only to find himself sinking down as he did so. We got out well enough though, once we’d stopped laughing. 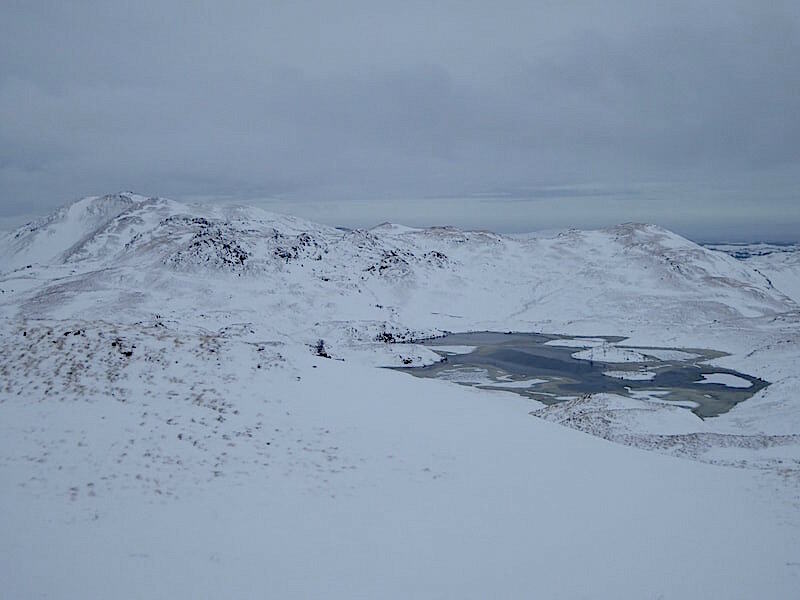 Angletarn Pikes straight ahead from just above Cat Crag …..
….. and then we drop down to the tarn where a photographer was taking full advantage of the snowy landscape. 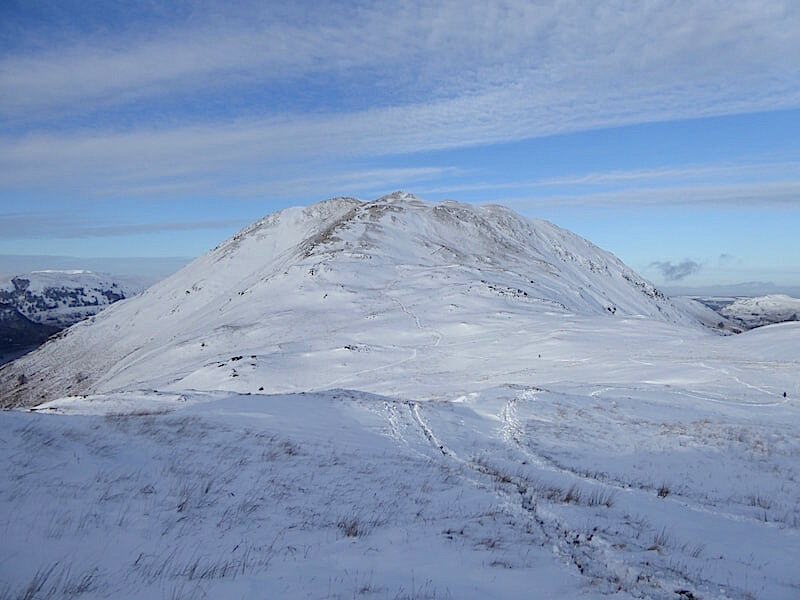 We don’t disturb him and carry on across to a little knoll above the tarn where we have decided to take a break and get the soup and sandwiches out. 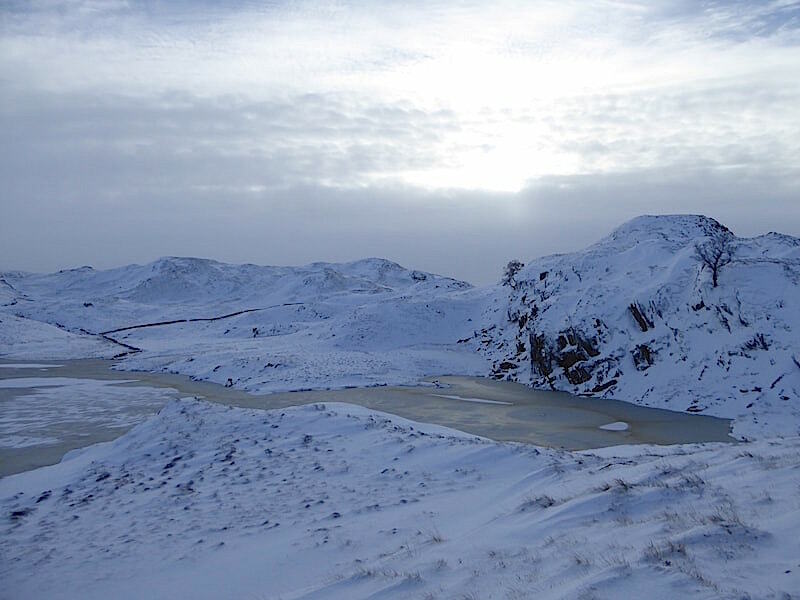 A few views of Angle Tarn from our picnic spot …..
Cat Crag from our picnic viewpoint. The photographer has collected his gear and is making his way up there to take more shots. 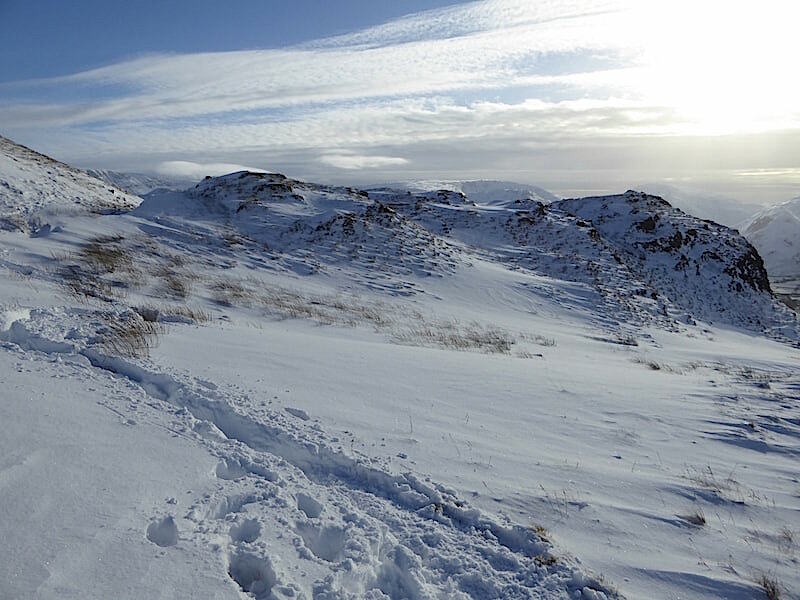 I bet he’s as glad to be using our footprints as we were to be using someone else’s climbing up Brock Crags earlier. Another thin band of cloud has drifted over us at the moment and its still looking very grey and gloomy to the south of us. Its only a thin band of milky cloud though and in the muted light its creating a rather interesting atmosphere. It may look very cold but it wasn’t thanks to the complete absence of any air movement and it was a lovely spot to take a break. Just us sitting quietly enjoying the hot soup and sandwiches and the photographer moving silently from one vantage point to another to capture that perfect shot. 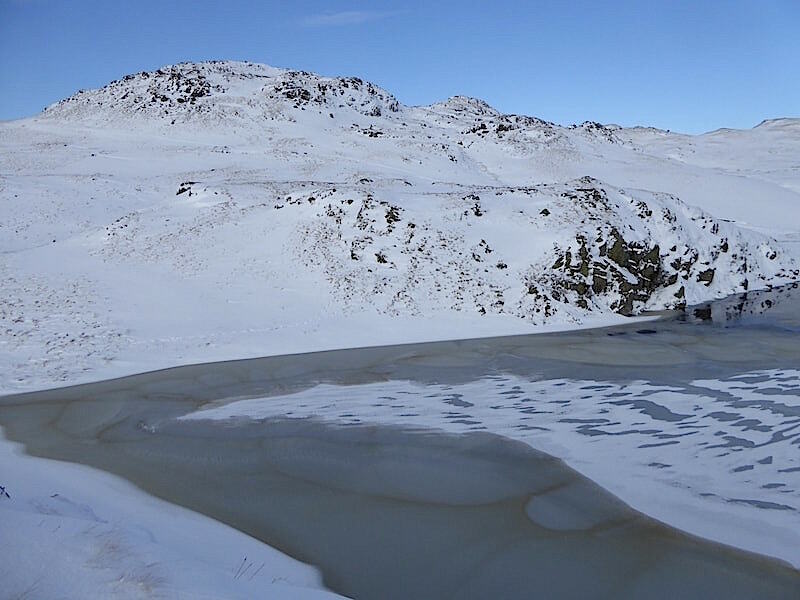 It was a different matter on the far side of the tarn where there were dozens of walkers heading around the tarn and onwards to Satura Crag and beyond. 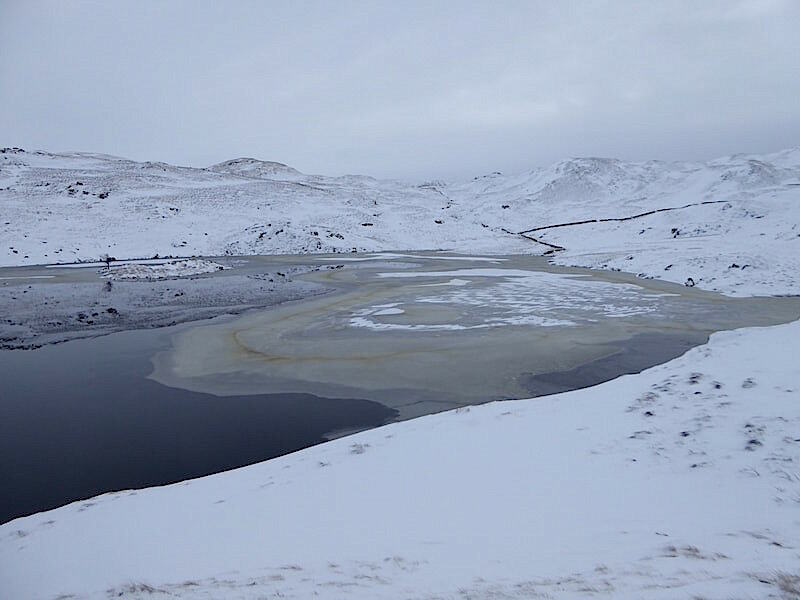 The sunlight dimmed a little and created this chilly looking scene across the tarn to Brock Crags and Cat Crag. 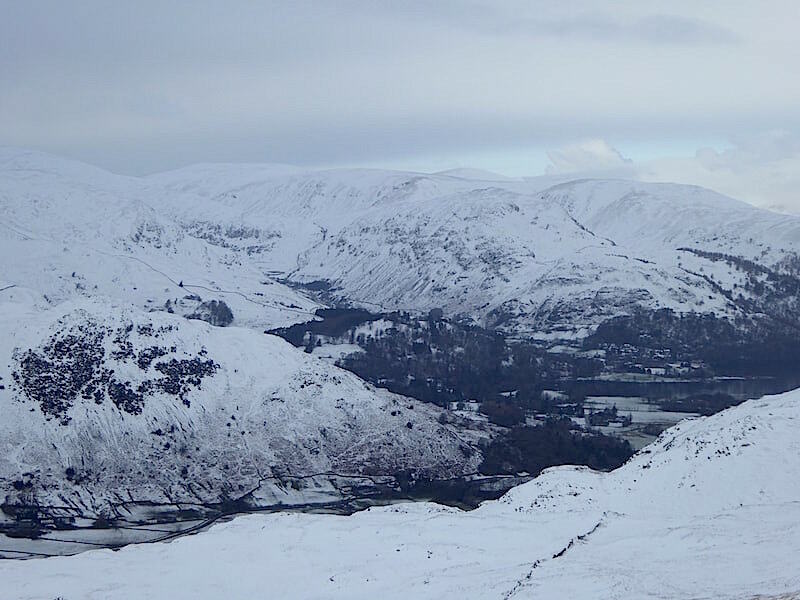 Behind us Saint Sunday Crag and the Helvellyn range catch a little sunlight. Between us and them you can see the undulating nature of the terrain and why it gets tricky to avoid the snow filled hollows. 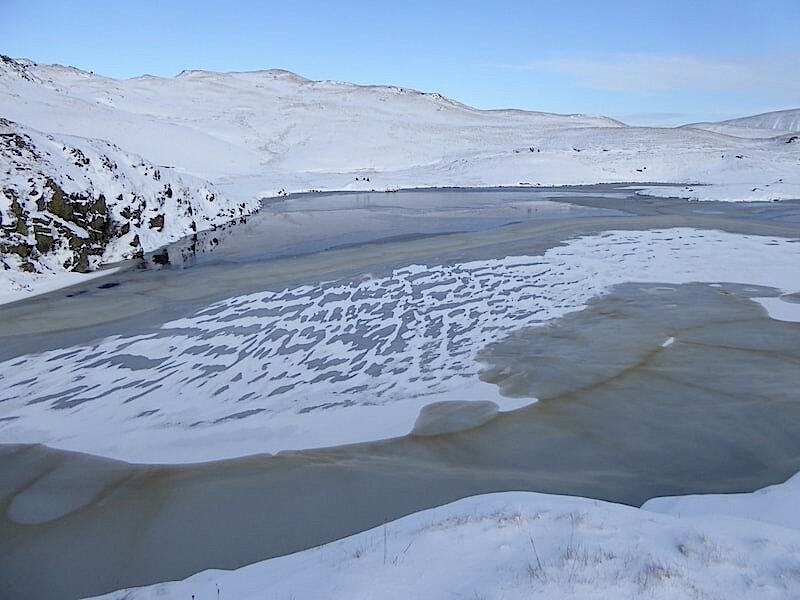 I walked over to the edge of the picnic knoll to take a few shots of the ice patterns on the tarn ….. The photographer returned as we were beginning to leave and he shouted across to us “I don’t want to leave it, I don’t want to go home and leave all this.” I knew just how he felt and replied with the same sentiment and adding that it is always a wrench when the time comes to leave. After our lunch break we must have spent a good half hour going from one spot to another, just as he did, and simply enjoying what nature was offering us today. But eventually you have to turn your back and take your leave. 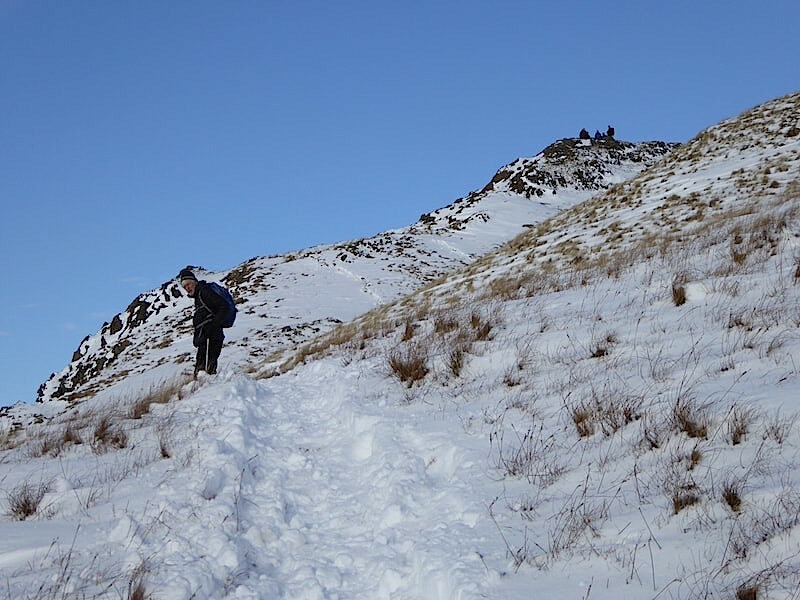 We begin the climb across the low slopes to pick up the path running below Angletarn Pikes and enjoyed a few more minutes of sinking into deep snow as we did so. 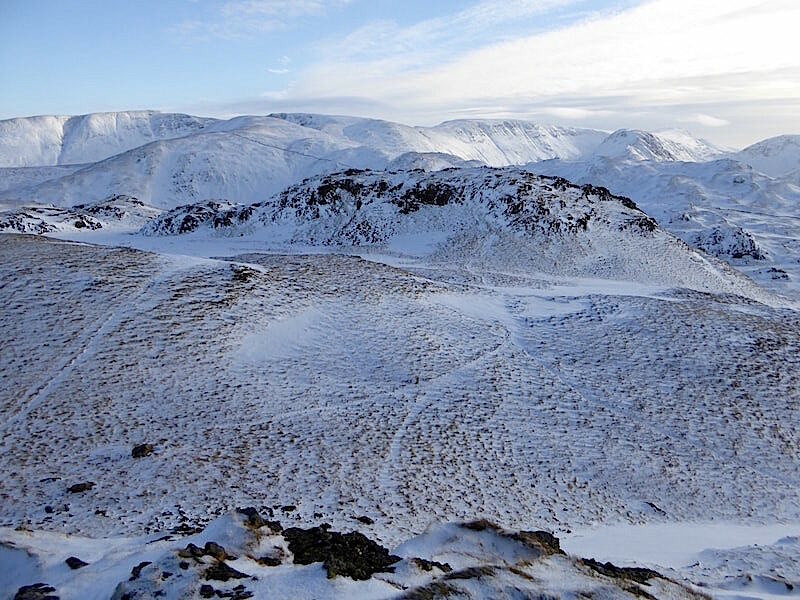 A flattish rock sticking up through the snow provided a steady enough foothold for me to take this shot looking south where the Kirkstone Pass, running between Caudale Moor and Red Screes, creates the deep V shape on the centre skyline. A look back at the sunny scene behind us where the photographer, at the end of the tarn inlet, is still reluctant to leave. Who can blame him? 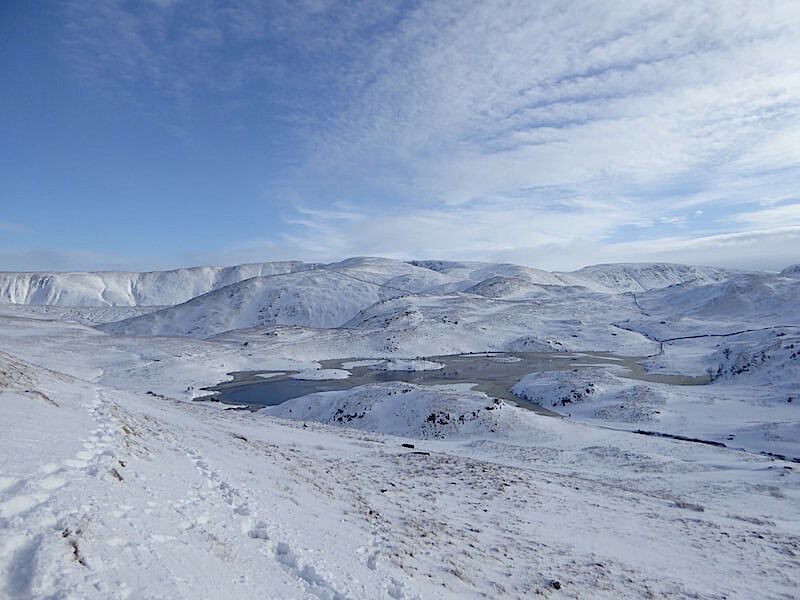 A little to the left of the previous shot and the sunlit walls of Loadpot Hill and Wether Hill form the skyline view. We reach the path below the Pikes and I take another look back at the wonderful scene. If you zoom in you might be able to pick out the photographer who is still standing at the end of the tarn inlet and who still cannot tear himself away. He will always have the photographs he has taken but they probably won’t fully recreate the magic that he’s experiencing right now, and it must have been a very special experience for him to want to shout out to two strangers that he didn’t want to go home and leave it. Today will always be in his heart, and just like him, we all have days on the fells that are so special in one way or another. 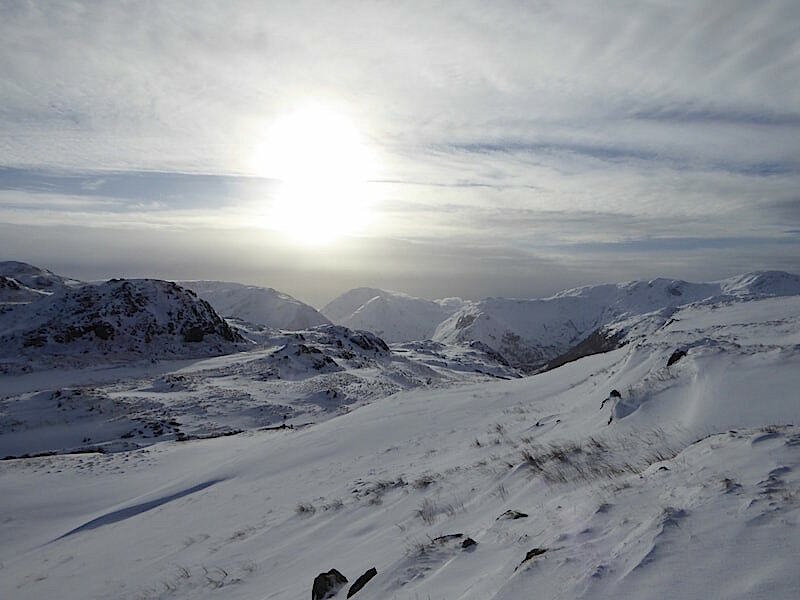 Another look south towards the Kirkstone Pass V shape between Caudale Moor and Red Screes and, after peering through it, it seems to show that there is indeed an inversion going on around Windermere and Ambleside. 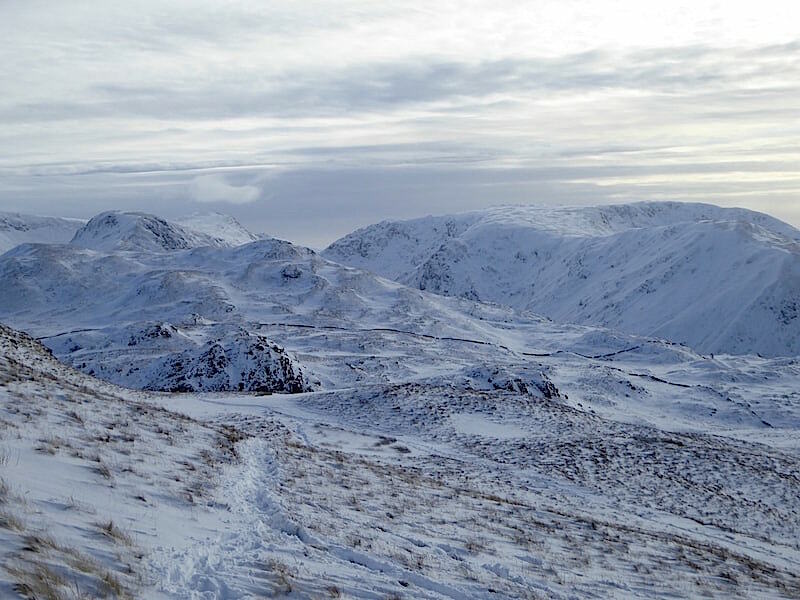 The path below the Pikes contours around and gives us this view along Deepdale and the hause at the head of it. 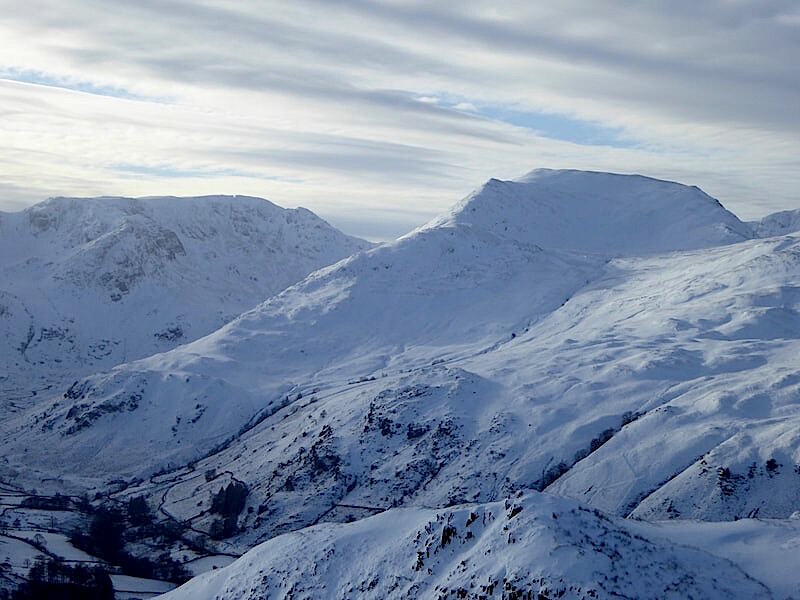 Saint Sunday Crag and the Helvellyn range are back in view as the path curves northwards …..
….. but before heading back down to Boredale Hause we take a short diversion up to the north top of Angletarn Pikes where quite a crowd looks to have gathered. 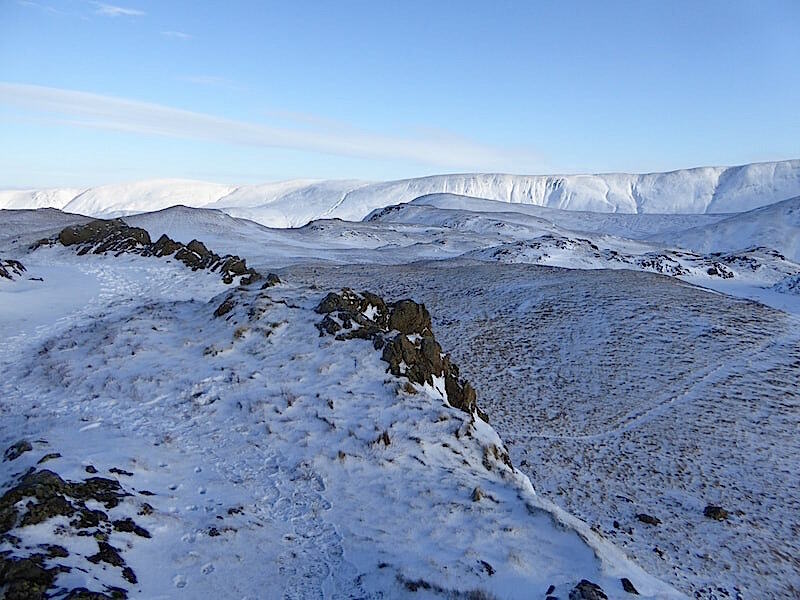 A quick look back down to the path junction where we turned up to the north top …..
….. and a quick look at the deep drifts blanketing the crags below us. 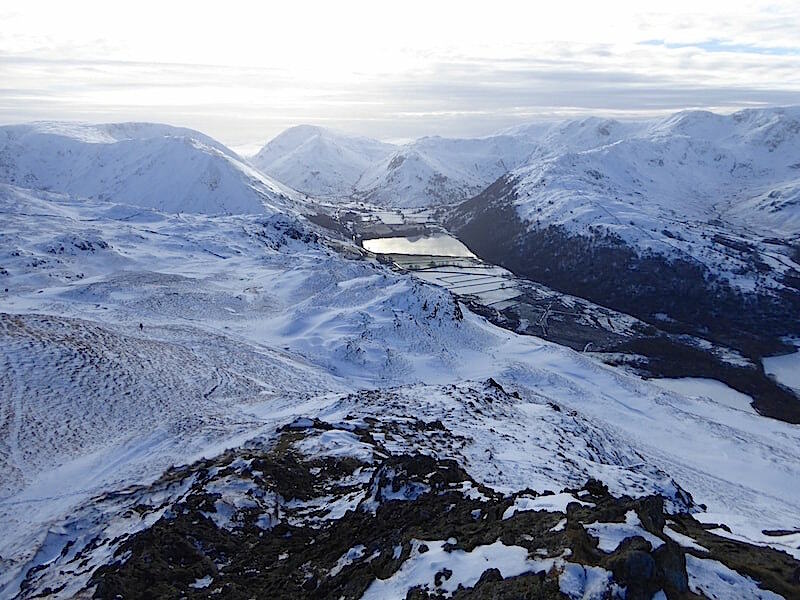 An absolutely stunning view today of Brothers Water and the surrounding fells from the north top of Angletarn Pikes …..
….. an an equally magnificent one of the fells to the west of us. 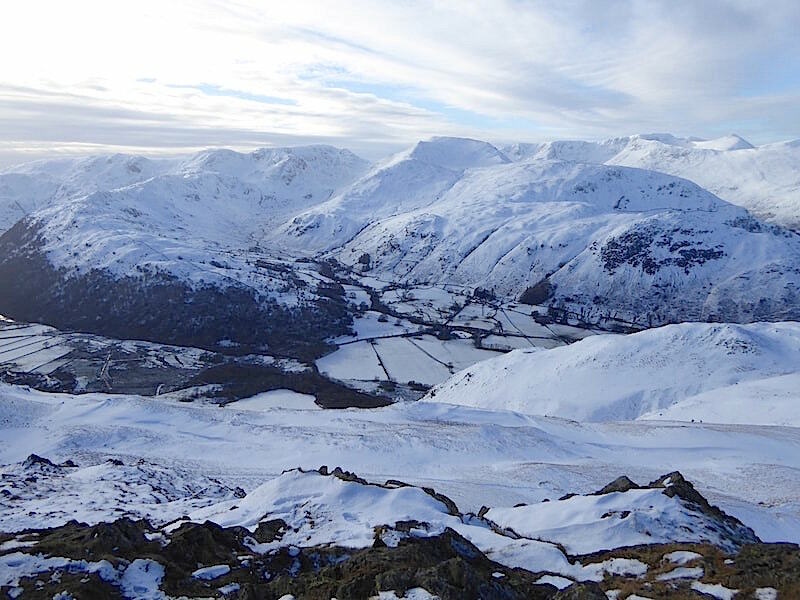 Looking to the north west towards Glenridding and Place Fell with Blencathra and its many ridges sparkling in the far distance. The often neglected south top below us with the High Street range on the skyline. 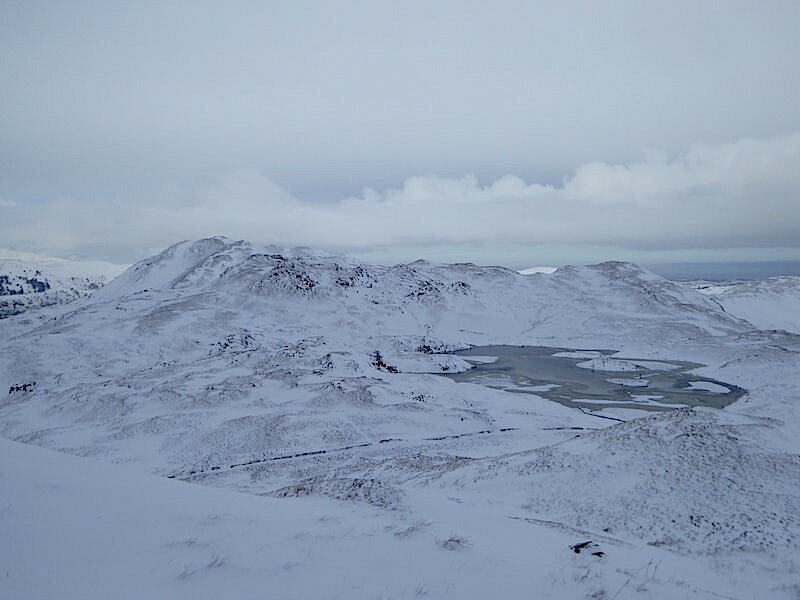 Looking eastwards with Bonscale Pike, Loadpot Hill and Wether Hill on the skyline. 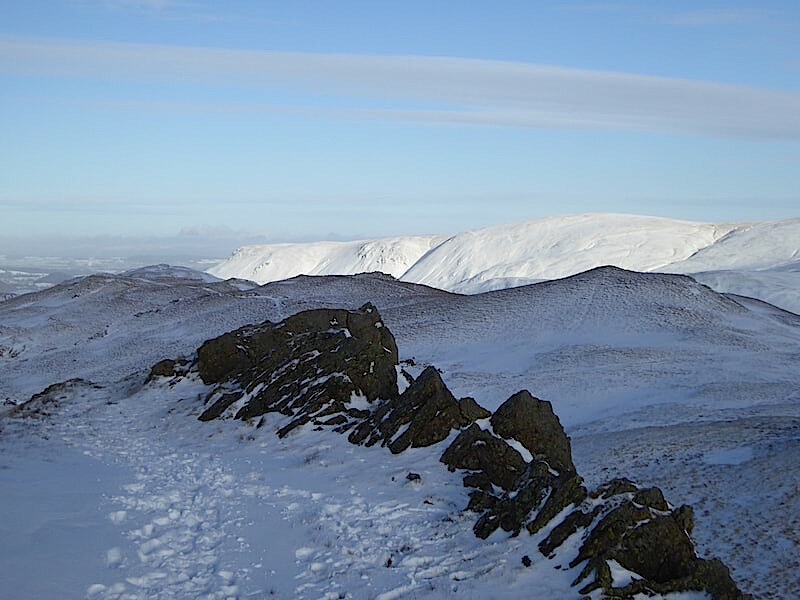 The other walkers left the summit which allowed for a better view of Bonscale Pike and Loadpot Hill and the clear blue sky all the way to the North Pennines. 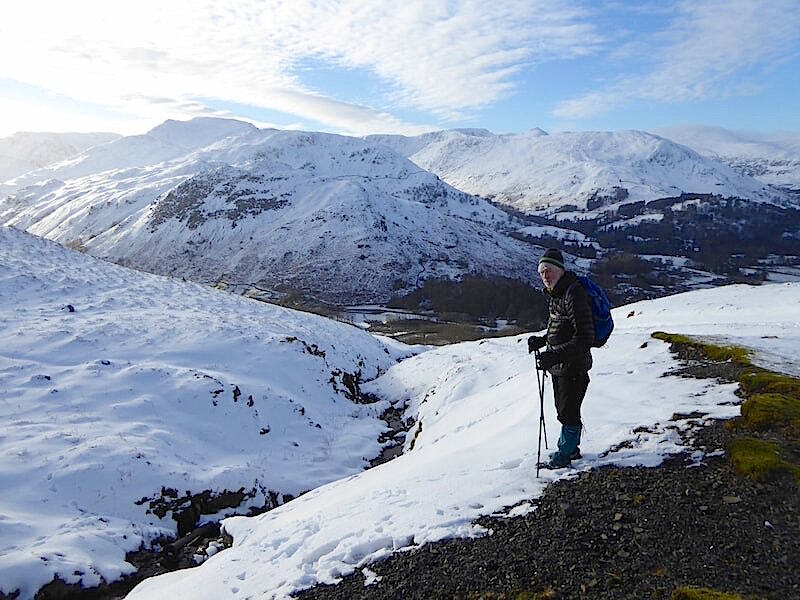 Down from the north top with a look back at the snow drifts filling the hollows of the crags of Dubhow Brow as we make our way back down to Boredale Hause. As we walked along here a couple of walkers with a pair of West Highland White terriers were coming towards us. We aren’t dog owners so perhaps we aren’t qualified to comment on the wisdom of bringing such small dogs to walk in such deep snow, but we could see that they were having a real struggle to get through it. For much of the time only the tops of their heads were visible, their coats were covered in balled up snow and we wondered how much longer it would be before their owners resorted to carrying them. 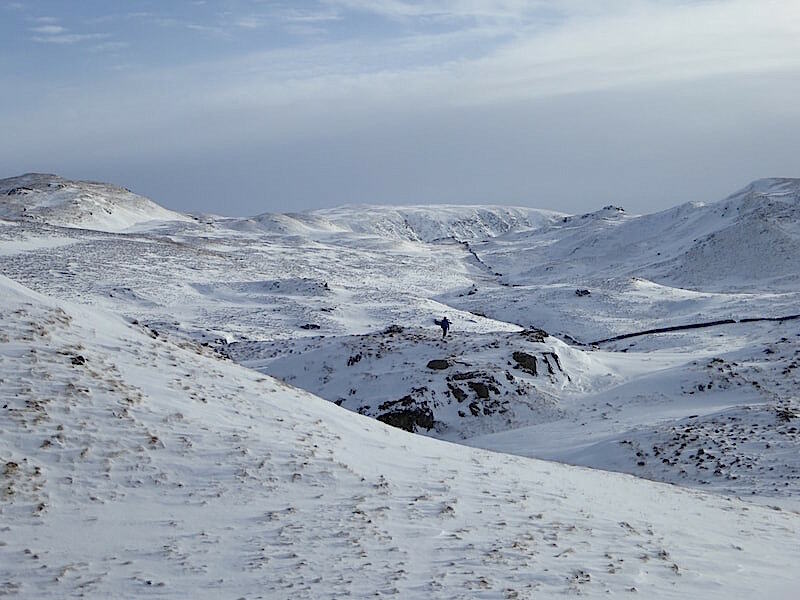 The paths were so deeply filled with snow that for the most part it was simpler to walk along the edges on either side. 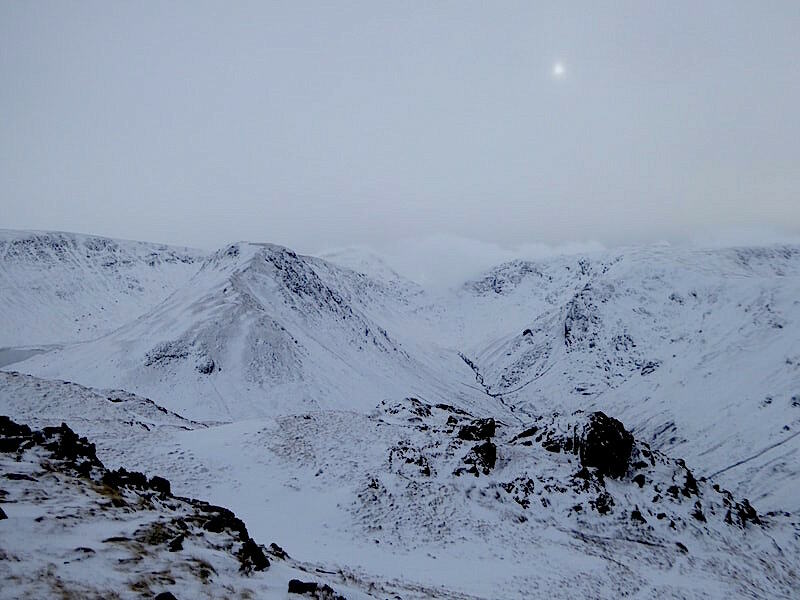 On the left skyline the still sparkling Blencathra has become more prominent as we head towards Place Fell. 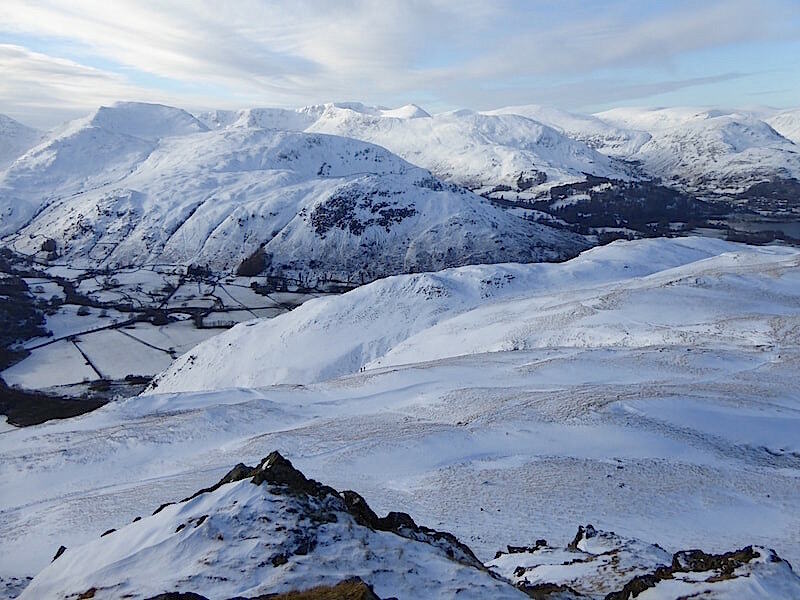 Another V shape on the horizon, this time between the huge bulk of Fairfield on the left and the majesty of Saint Sunday Crag on the right. Bands of light cloud drifted along constantly changing the light and the mood. 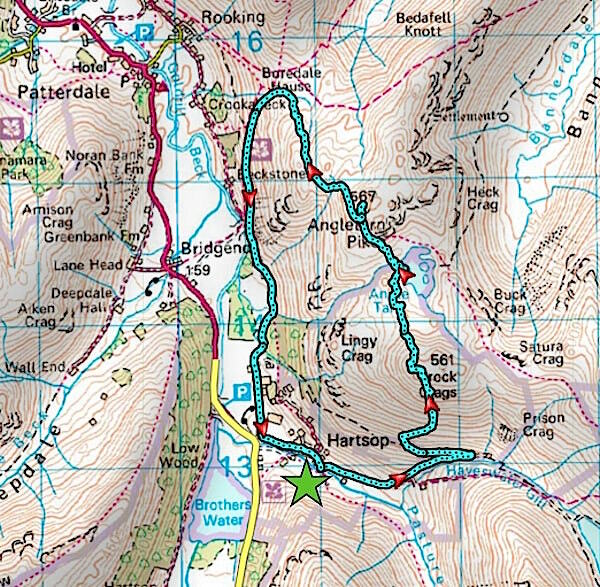 Walkers, coming from all directions, were dotted around here and there and making for Boredale Hause. 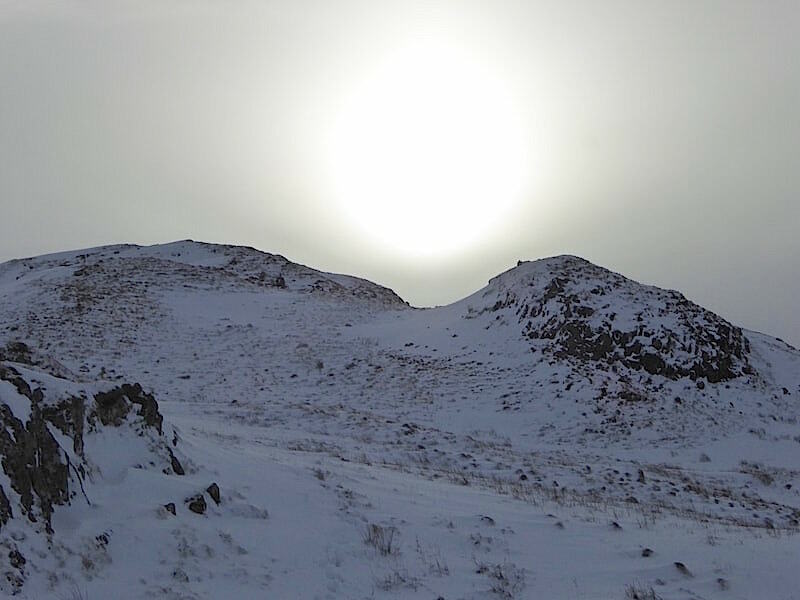 I had a good look but I couldn’t see anyone walking up or down Place Fell. 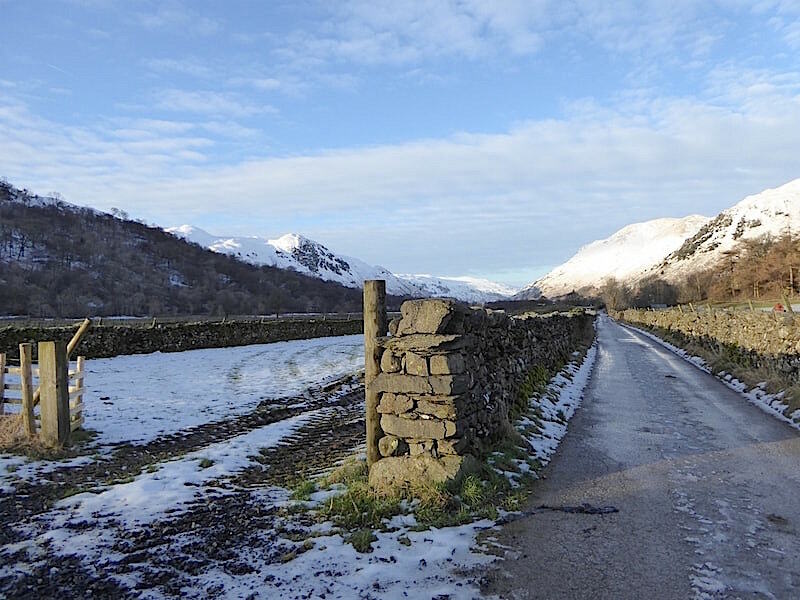 Down to Boredale Hause and a quick stop for drinks and then its down the path leading to Bridgend …..
….. with this lovely view along the fields of Patterdale with Glenridding and the head of Ullswater beyond them. The bands of cloud are getting thinner and fewer and we enjoy the warm afternoon sunshine. As we rounded the bend in the path we met another pair of walkers, also with two very small and very short legged dogs, even smaller than the Westies. These dogs were managing very well at the time as the snow was less deep on this path but we did mention to their owners that beyond Boredale Hause it was much deeper and that it might be hard going for the dogs. They probably weren’t going very far since the chap mentioned that he was going to fly a drone when they were a little higher up and take some pictures from it. They were a very nice and friendly couple and we had a few minutes chat before saying our cheerios and going our respective ways. Hope he got some good shots from the drone. 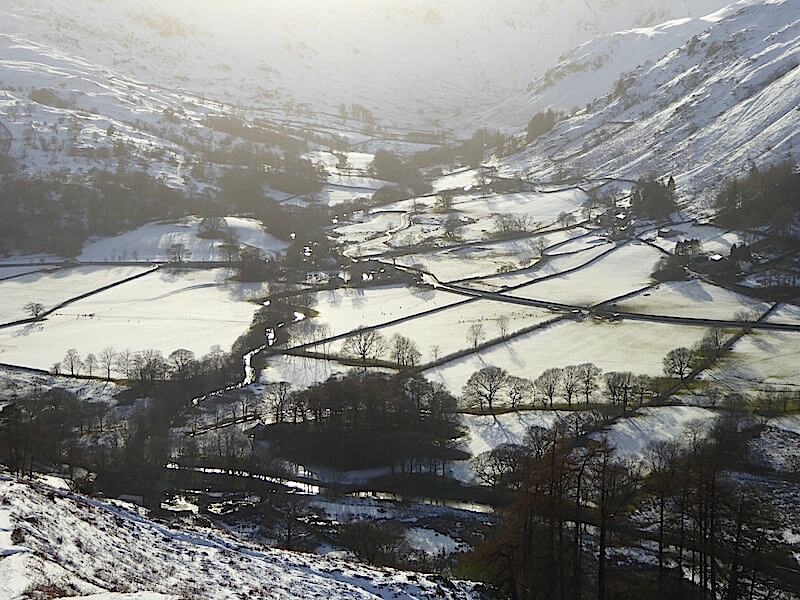 The snowy fields of Patterdale looked very striking in the bright sunlight. 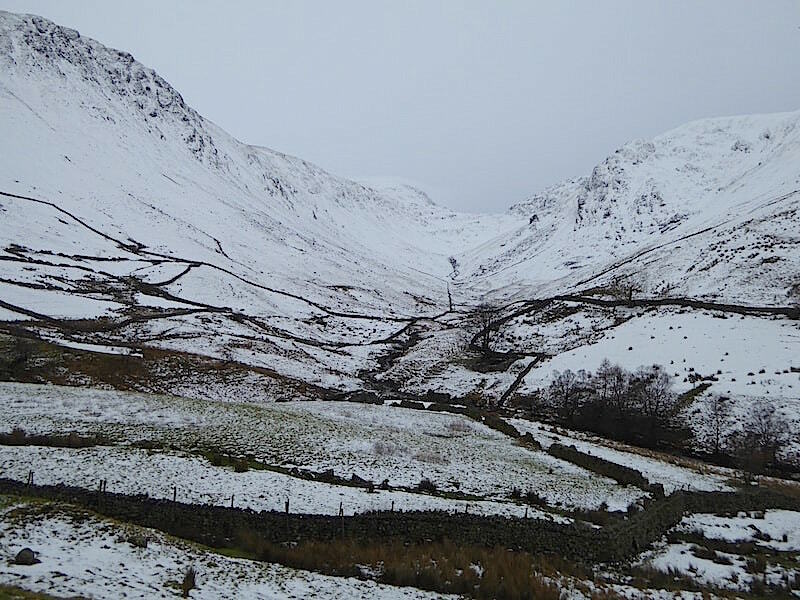 The Kirkstone Pass snakes it way between Caudale Moor and Red Screes whose tops now have ribbons of cloud streaming across them. 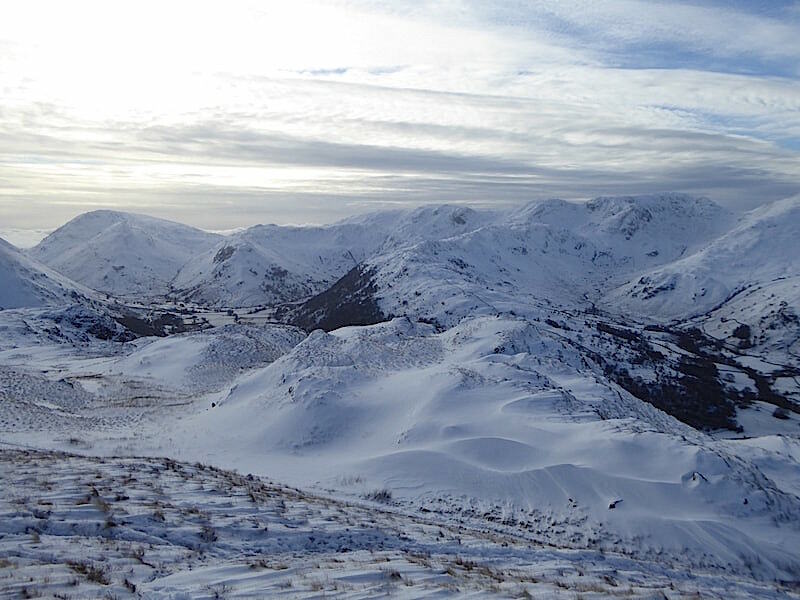 A last look back at Place Fell as we make our descent. A very pleasant and sunny walk down, still along a snowy path but its much less deep now and a whole lot easier to walk on. The path on the right is the one we have just come down, the path immediately ahead would take us down to Bridgend in Patterdale. The one we need to take is the one not in the shot as its right behind me and it will take us southwards along the valley, below the slopes and crags of Angletarn Pikes and Brock Crags, all the way back to Hartsop. Hartsop Dodd reflected in the puddles along the lane as we walk along to Hartsop. Beautiful afternoon light falling on Gray Crag and Hartsop Dodd now. A look back along the lane before we turn up into the village. 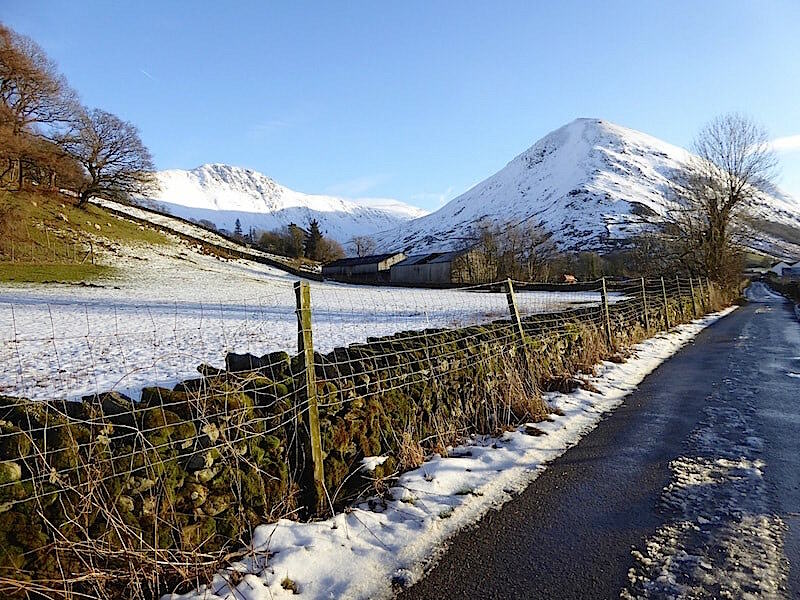 Walking up the lane into the village with a lovely view of Brock Crags glowing in the afternoon sunlight. One of the 17th century cottages, complete with spinning gallery, in Hartsop village. 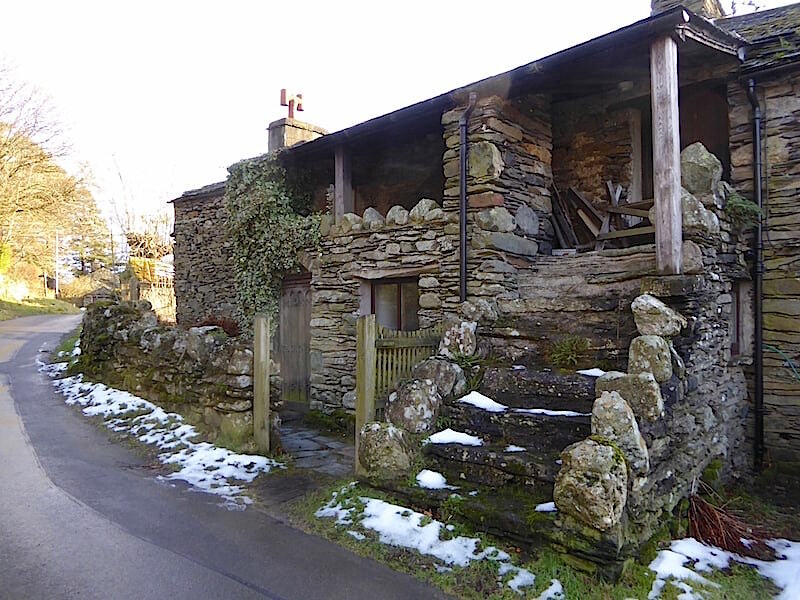 Spinning galleries, built on an upper floor under the eaves, providing useful storage space and somewhere to sit and spin on fine summer days, are a notable feature on a number of buildings in the Lakes many of which are now listed buildings. Well, the car park is just a little further on around the bend in the lane so we are almost back where we started and so today’s walk comes to an end. 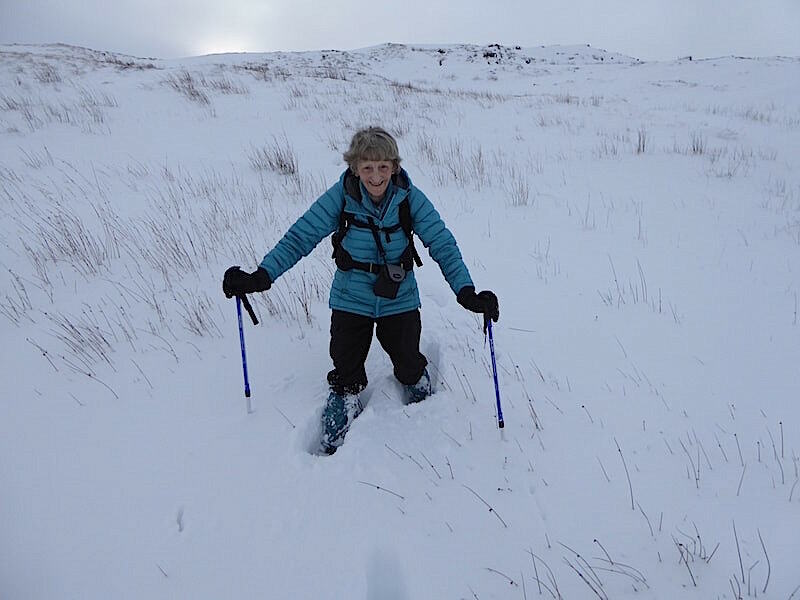 It hasn’t been a long walk in mileage terms but ploughing through such deep snow does always make you feel as though it was considerably more than it actually was. A shortish walk it may have been but it was full of little highlights which will make it all the more memorable. 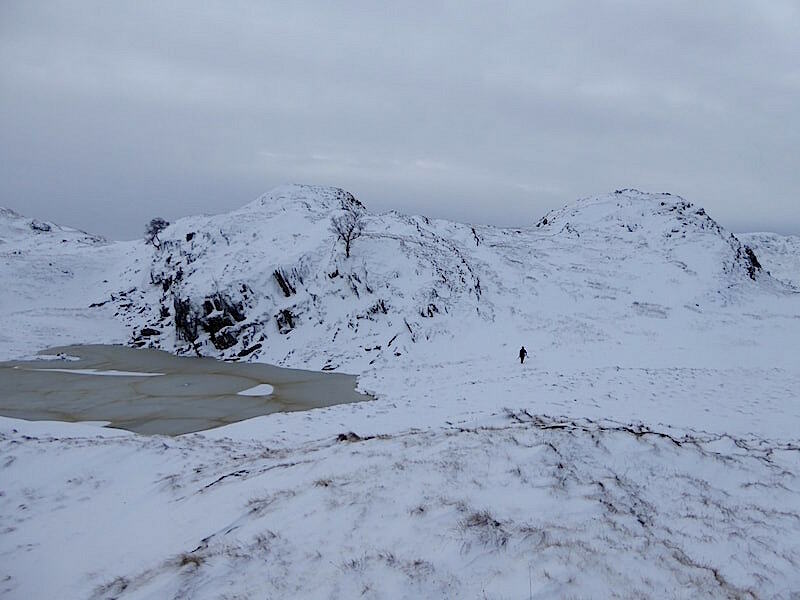 Climbing off path through deep snow up Brock Crags was challenging even with footprints to step into, the exquisite Angle Tarn was, as always, a joy to behold, and the photographer who really didn’t want to leave the beauty of his surroundings touched our hearts. 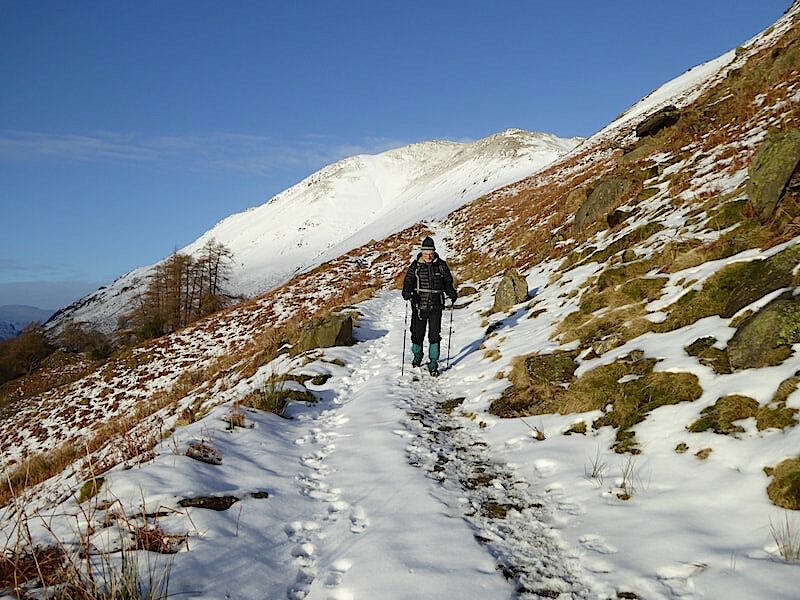 We have really enjoyed our walk today, its been huge fun with plenty of laughter, both of which have been in short supply recently, and probably ranks as one of the best winter walks we’ve had in a long time. Hope you have enjoyed it as much as we did.